The author is engaged in East Mediterranean Studies, concentrating on the ancient Near East and Aegean. He has performed research for Velikovsky on topics suggested by the latter, including much of the material found in the present article. Although Immanuel Velikovsky considers Ages in Chaos, his historical reconstruction, to be his opus magnum, for over 20 years ancient historians and archaeologists have ignored this aspect of his work. It is therefore gratifying to note that Prof. W. H. Stiebing, Jr. has broken the silence. Stiebing has obviously read Velikovsky's published writings on this topic, and has considered not only what is written but its applicability and ramifications. Unlike his colleagues, who may or may not have done even that much, he has gone a step further. In the Fall, 1973 issue of this journal he voiced "a criticism of the revised chronology" (1). His studies have led him to the conclusion that Velikovsky's reconstruction is "not in harmony with the mass of archaeological evidence presently at our disposal" (2). While the research that I have done over the past five years has led me to the opposite conclusion, I do not write this as an attack upon Stiebing or his article, but in response to his request that "other specialists in ancient history" "join the discussion and present their views on Velikovsky's theories." Like Stiebing, I too will leave "the question of whether or not astronomical catastrophes of the kind described by Velikovsky are possible"(3) for others more competent in that area to answer. In any case, the historical reconstruction is a matter totally independent of theories of global upheavals. This article will limit itself exclusively to archaeology, ancient history, and art history, pointing out some of the difficulties which exist for adherents to the accepted chronology, but which cease to be problematical, and, in fact, make perfect sense, when the revised chronology is applied. The subjects touched upon here are restricted to ones Stiebing himself mentioned: the archaeology of Mycenae, Tiryns, Troy, Ugarit and Alalakh (4). The nature of this reply and the amount of material to be examined allow only a brief account on matters which I hope to treat in greater depth at a later date. Here only an outline of some of the problems will be given. Before we embark on the present topic, it is only right to acknowledge that Velikovsky has provided many of the answers to Stiebing's points in the unpublished sequels to Ages in Chaos. Because the sequels have not yet been released, valid questions, such as those posed by Stiebing, do arise and deserve to be answered. Stiebing informs us that "the palaces of Mycenae and Tiryns could not have been constructed in the eighth century, and the end of the Mycenaean Age ... cannot be associated with catastrophes of the eighth-seventh centuries B.C." (5). Let us first define our terms. Everyone accepts "the Mycenaean" or "Late Helladic" or "Late Bronze" Age of Greece as the period of Greek prehistory contemporary with the reigns of the 18th and 19th Dynasties of Egypt; this alone is responsible for the absolute dates of ca. 1550-1100 B.C. for the "Mycenaean Age" (6). If Velikovsky is correct in lowering the Egyptian dates by 500-700 years, the Mycenaean dates must follow suit. If Stiebing is right, and the Mycenaean period is soundly established, it follows that the Egyptian dates cannot be lowered. In my previous article in this journal the Mycenaean-Egyptian dependency was explained, and examples of 600-year stratigraphical, archaeological, and radiocarbon problems were mentioned for the Late Helladic site of Pylos (7). The same sort of problem exists at nearly every Mycenaean site, but since Stiebing confined his remarks to Mycenae and Tiryns, they alone will be dealt with here. Figure 1. 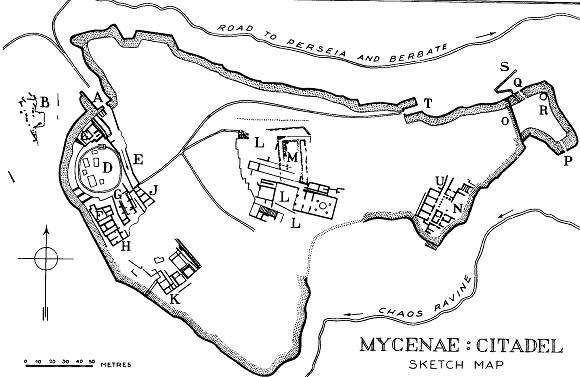 GROUND PLAN OF MYCENAE. (From A.J.B. 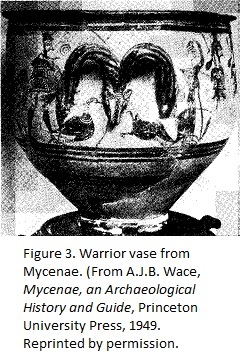 Wace, Mycenae, an History and Guide. Reprinted by permission. From literary accounts and archaeological findings, the ancient city of Mycenae in the Peloponnese of Greece is commonly regarded as the political and cultural center of Late Bronze Age Greece, and has thus contributed its name to this period. According to mythology, the city's founder was the legendary hero Perseus. It was for a later king of Mycenae that Herakles performed his 12 labors. One of its last heroic kings was Agamemnon, commander of the Greek expedition against Troy. Upon his return from that great campaign, he was murdered in the palace by his queen, and was later avenged by his children Orestes and Elektra. First excavated by Heinrich Schliemann in the 1870's in one of the earliest systematic campaigns at a Late Helladic (LH) center, Mycenae is one of the most thoroughly excavated and studied places in Greece. For almost a century now, German, Greek, and British prehistorians have revealed a wealth of archaeological information as well as costly and beautiful artifacts. Work still continues there on a yearly basis. If the revised chronology is valid, we should expect that some 500—700-year problems have been unearthed at this site. What do we find? Velikovsky and Greenberg have already treated the subject of the Lion Gate of Mycenae (Fig. 1:A), and demonstrated how and why the stone carving and the gateway it surmounts, now ascribed to ca. 1250 B.C., were originally dated half a millennium later, in the 8th century B.C. (8). To the remarks already made in their articles, I would merely add an observation by a highly respected contemporary archaeologist who does accept a 13th-century attribution for the gate. "More than five hundred years were to pass before Greek sculptors could [again] command an idiom which would satisfy these aspirations in sculpture and architecture" (9). The Lion Gate was the main entranceway of Mycenae. Between the gate and the building known as the Granary (Fig. 1:C), a test trench was dug. Since this provides the best stratigraphical section of the site, and "is the main basis for trying to date the fall of Mycenae" (10), the findings are of particular interest to us. Thirteen strata were differentiated. The bottom 10 belonged exclusively to the period when LH IIIB-C pottery was in vogue (set at 1300 or 1350-1100 B.C. ), at most 200-250 years (11). On the average, then, each layer represents the passing of at most about 20-25 years. The 11th layer, in addition to "12th-century" LH IIIC pottery, contained a significant number of fragments of Orientalizing ware (i.e., 7th-6th centuries B.C.). This layer, which, by the accepted scheme, must represent the passage of some 500-700 years, was only about 1/6 the total thickness of the 10 beneath it, which represent only 200-250 years. It was, in fact, thinner than one of the earlier layers representing 20-25 years. Just inside the Lion Gate, Schliemann discovered a circle (Fig. 1:D) containing the graves of royalty. In the 1950's a second circle of royal graves was discovered and excavated. It is for the most part, contemporaneous with the first, beginning a bit before it and discontinued while the first was still in use. These two Grave Circles have furnished some of the richest and most exciting finds to come from Mycenae, or, in fact, from any prehistoric European site. Since the graves are mainly contemporaneous with the early 18th Dynasty of Egypt, they are put in the 17th-16th centuries B.C. (14). Where did the idea of such grave circles originate? N. G. L. Hammond contends that they came to Mycenae from Albania. Comparing the Grave Circles at Mycenae to Albanian grave mounds, he sees "close analogies in the details of the burial customs, the structure of the mortuary chambers, and the contents of the graves" (15). Regarding the technique of construction, "the similarities indeed are remarkably close" (16). The weapons from the Albanian graves display "astonishing similarities" to those from the Mycenaean Grave Circles (17). After considering many factors, Hammond said, "the answer can only be that the tumulus-burials of Albania ... are the antecedents" of those at Mycenae (18). There is a serious drawback, however. The excavators of the Albanian graves at first claimed that typologically, these burials were no earlier than the 11th century B.C. They have continued to assign them 500-600 years later than Hammond (19). More recently the 11th-century date has gained the support of A. M. Snodgrass (20). Despite "close analogies," "remarkably close," indeed "astonishing" similarities, how can 11th century graves be the "antecedents" and models for graves 500 years older at Mycenae (21)? Above many of the graves in the two Grave Circles of Mycenae stood stone stelae, some plain, others decoratively carved. If, as is maintained, they are of a 16th-century date, 500 years were to elapse before the custom of placing tombstones over graves "returned" to Greece (22). More important than this 500-year lacuna is the subject matter on some of the sculpted stelae. 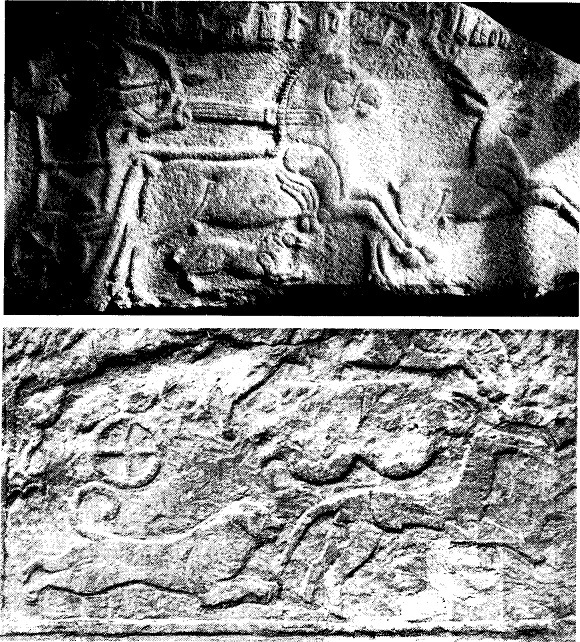 The scenes of hunting and battle depicted, as well as the general carving technique, remind one very much of Neo-Hittite relief sculptures supposedly six-seven centuries later in date (23). The 9th-century Hittite relief of a stag hunt from Malatya is strikingly close in iconography to the "16th-century" stele above one of the graves at Mycenae (Fig. 2) (24). The burials inside the two Grave Circles consisted of stone-lined shafts. In addition to the bodies of the Mycenaean rulers, they contained much wealth in the form of gold masks, inlaid daggers, gold and silver cups and goblets, gold jewelry and foil, etc. Almost immediately after the discovery of such objects from the first Grave Circle, dating problems arose. One author was so struck by the resemblance of some of the artifacts from the Grave Circle to "later" material, that he proclaimed that, "if we are not to throw aside all that we have learnt of the development of early Greek art" (29), at least some of the objects must be assigned to "the ninth century or later" (30). He proposed, therefore, that graves of the time of the early 18th Egyptian dynasty were opened after ca. 500 years, and, instead of their being looted or re-used, later material was deposited. This theory is universally rejected (31). The graves and their contents from the first Grave Circle only span about a century. If it was the 16th century, however (32), their resemblance to later graves and objects seems all the more remarkable, since hundreds of years were to elapse before similar graves and objects "re-appeared." It is true that the opinions about the grave contents listed above were written 70 years and more ago by men who knew of no Dark Age following the Mycenaean period, separating it by a "gap of emptiness"(33) from the later objects which they considered to be similar or identical and sometimes contemporaneous. Their observations are nevertheless still valid today. What they had "learnt of the development of early Greek art" (34) had to be unlearned and relearned. Do the Shaft Grave artifacts still trouble modern scholars? Recently an expert on Greek pins examined some specimens from one of these graves. Two of them "look like forerunners of the sub-Mycenaean pintype. This must be coincidence: they are separated by an interval of 400 years, and this cannot be bridged" (35). Leaving behind the Grave Circle and the 500-year problems of its northern "prototypes," its stelae, and contents, the first house we reach (Fig. 1:F) within the fortification walls is that named for the large, decorative mixing bowl found within it. Schliemann discovered this bowl about 100 years ago, and, because of its friezes of armed men, it has been dubbed "the Warrior Vase." This is probably the best-known piece of Late Helladic pottery (Fig. 3). For quite some time after its discovery, it was dated to the 7th century B.C. Its peculiar bull's-head handles were regarded as being definitely derived from those found on 8th-century vases (36). The friezes of soldiers around the vase were unhesitatingly attributed to the Proto-attic period (i.e., early 7th century B.C.) on the basis of style, and were, in fact, even compared to the work of a known 7th-century artist (37). Other technical and stylistic features were then considered to indicate a date between 700-650 B.C. for the vase (38). That same vase is now firmly dated by the Egypto-Mycenaean scheme to ca. 1200 B.C. (39), leaving the problems of the peculiar handles and of the figural style. In general there is quite a puzzle today regarding the relationship of Mycenaean figural-style pottery and the return to this style after several centuries, especially since there seems to have been "the darkness of taboo on figured representation" for a few of those intervening centuries (40). Recently one scholar was quite impressed by the resemblance of figures on 7th-century pottery to those on the Warrior Vase, which, he conceded, must be "more than five hundred years older." He speaks of "an obvious link" to connect the two sets of pottery (41). If, however, 500 years really do separate the Warrior Vase from 7th-century ware, and nothing similar exists to fill the gap, there is, as everyone admits, an "obvious" similarity, but there can be no "link," obvious or otherwise. "One might almost say that the decorators of Protoattic pottery took up the animal [and human] designs where their predecessors of late Mycenaean times had left off. The similarity is very striking" (42). With 500 years separating the two periods it is "very striking" indeed (43)! Another building within Mycenae's citadel walls has been recently recognized as a Late Helladic shrine (Fig. 1:K) (44). A number of curious and interesting cult objects have come to light. Among these were quite a few idols, with their lower bodies "made on the wheel, like pottery" (45) in a typical Mycenaean process (46). They are assigned dates from the 14th century till sometime just prior to ca. 1220 B.C. (47). There is then apparently a break in the Peloponnese between 1200 and ca. 700 B.C. when "wheel made work in the old technique" suddenly makes a "strange revival" (48). One of the "13th-century" idols within the shrine had a "curious" trait (49). The lips were molded to form an archaic smile (50), a feature typical of 7th-6th-century statues and figurines. Between ca. 1200 and the 7th century B.C. no evidence for this feature can be found. From the shrine we will travel to the palace of Mycenae (Fig. 1: L). It is indeed unfortunate that a tremendous amount of information is lost to us due to severe erosion and the less sophisticated archaeological techniques of the early excavators. Fragments of 7th-century stone sculpture were found in the main court of the palace, and I, for one, would like to know their stratigraphical relation to the 13th-century palace. It is agreed that a 6th (perhaps 7th)-century temple stood here, and again, I would like to know its exact location and how it relates to the 13th-century finds. When we examine Tiryns' palace and temple, my special concern for these matters will become obvious (51). Two final objects found within the citadel of Mycenae, but whose exact location are unrecorded and thus unknown, will concern us. They are a fragmentary figurine and a bronze tripod. The figurine fragment (assumed to represent someone making bread), as well as a similar example from the site of Tiryns, were considered to belong to the 13th or 12th century, despite the fact that several 7th-6th-century examples of this type exist with none in between. When a third figurine of unknown provenance but Late Helladic in style was published, the three should have formed a tight little "Mycenaean" group separate from the "later" group. Instead Carl Blegen, the publisher of the third figurine, redated the other two to the 7th-6th centuries, placing them half a millennium later than had been assumed, but connecting them with the later examples. His example was definitely Late Helladic III in style and thus could not be moved. It is now the sole Mycenaean "antecedent" of the later group and is "separated from them by a long interval" of 500-600 years during which similar figurines do not exist (52). A bronze tripod cauldron from the Mycenaean citadel, dated most probably to the 13th or 12th century B.C., has a "particularly important" shape. Its "close resemblance" to bronze tripods of ca. 750 B.C. is difficult to explain (53). Noting this close resemblance in shape, some archaeologists believed that there must have been a continuous production of these metal tripods between the two ages (54). Rather than vindicating this view, however, more recent excavations reveal that between the Mycenaean Age and the late 8th century, continuous manufacture of metal tripods of this, or, in fact, any shape did not take place (55). We have seen a number of chronological problems within the- fortification walls of Mycenae. The problems outside the walls, but still at the site of Mycenae, will concern us now. We travel first to a series of three houses not very far west of the fortifications (56). These were built and destroyed during the LH IIIB period (i.e., the 13th century according to the accepted chronology) (57). Uncovered within the debris of these houses were a number of tablets inscribed in Greek "by no, less than six hands" in the Late Helladic syllabary known as Linear B. These, along with more examples from Mycenae and other Late Helladic sites, convinced A. J. B. Wace, the excavator, that, during the Late Bronze Age, literacy was fairly widespread among the Greeks. "It is hard to believe that when the Mycenaeans had reached so comparatively high a standard of literacy they should have ceased entirely to read and write after the end of the Bronze Age and before the adoption of the Phoenician alphabet" (58). "It is incredible that a people as intelligent as the Greeks should have forgotten how to read and write once they had learned how to do so" (59). As incredible as it was for this renowned archaeologist to accept, "the iron fact remains that Greeks could not write between the thirteenth century B.C. and the latter part of the eighth" (60). All attempts to fill this gap have met with failure (61). In addition to the Linear B inscriptions, two of these houses contained ivory carvings, depicting, among other things, architectural columns, some fluted as were those of the archaic and classical periods. Wace thus spoke of the "long ancestry" of the fluted columns which first appear in the 7th century B.C. and flourished in the classical period (62). Not just the fluting was similar. So were the capitals. These "13th-century" ivories "show capitals that vary from the simple prototype of the Doric echinus to the elaborate and sophisticated form of the sixth century Archaic capital from a Treasury at Delphi which indeed is foreshadowed in the Mycenaean ivory models" (63). Since five to seven centuries must separate the ivory models from the 7th-6th century capitals and columns, and during those centuries there is no evidence for monumental architecture or columns or capitals, this "long ancestry" and foreshadowing of simple as well as "elaborate and sophisticated" forms is quite incredible. This will become even more apparent shortly. Leaving behind this row of houses with the problems they present us on literacy and architectural types, we shall look at another ivory carving of a column, this one from a Late Bronze Age tomb at Mycenae. This column was also fluted and "even has an almost perfect representation of a Proto-Ionic capital carved in relief" (64). How is one to explain this "almost perfect representation" of a capital which came into existence not in the 13th or 12th century but in the early 6th (65)? We next come to the so-called "Treasury of Atreus," a tremendous tomb constructed of stone with a conical roof resembling a bee-hive. The tomb is now assigned to the 14th or 13th century B.C. (66). In antiquity this sepulcher had an elaborate facade consisting of engaged half-columns surmounted by ornamental frieze work (Fig. 4) (67). The frieze work will be discussed in conjunction with triglyphs and metopes in the section on Tiryns. Here again we are concerned with the columns and capitals, for the latter "closely resemble" Doric column capitals from Italy of archaic date (i.e., 7th century B.C.) (68). In fact, "it is difficult to doubt that there is a real connexion between these columns and those of early Doric" architecture (69). What is this "real connection"? A gap of centuries is placed between the carving of the columns of the Atreus Treasury and the first Doric examples. It has even been stated that ca. 700 B.C. "Doric architecture seems to have arisen suddenly in Greece" (70), as if it were invented at that time without roots in the by-gone Mycenaean Age. Regarding the Doric column specifically, "it is incredible" that this "new and exotic form should have spread so fast, with no essential variation, through the whole of the western Greek world" (71). Are we to believe that a new invention, arising full-blown, spread that fast? Is it any easier to believe that one day ca. 700 B.C. someone saw the columns of the Treasury of Atreus (72), decided that that was the way columns ought to look, and quickly convinced the rest of the western Greek world to reproduce models which had been extinct for 500-600 years? In addition to column capitals similar to, yet centuries later than, those of the tomb's facade, Italy and Sicily have produced a number of their own "beehive" tombs. Since these are architecturally similar to the Treasury of Atreus, they were initially judged to be of the same antiquity as the Mycenaean tomb (73). Today, however, thanks to Egyptian chronology, the Treasury of Atreus is assigned to the 14th or 13th century B.C., while the Sicilian and Italian tombs only go back to the 8th-7th centuries B.C. at the earliest. This chronological gap of 500-700 years is quite embarrassing for a number of modem scholars who view the latter tombs as derived and copied from the Mycenaean ones (74). By redating the Treasury of Atreus to the 9th or 8th century B.C., we can better appreciate its distinct differences from canonical Doric architecture of the 7th century; and, at the same time, its obvious affinities to the Doric order and to the 8th-7th-century tombs to the West cease to be perplexing. Certain other Late Helladic tombs in the vicinity of Mycenae contained objects which undeniably date to the 8th-7th centuries. These are now interpreted as offerings of an otherwise unknown cult of the dead, which arose suddenly in the 8th century. Adherents to the cult decided to break into 13th-century tombs not to re-use or plunder them but to leave artifacts (75). Since many tombs had collapsed in antiquity, that explanation might work, were the custom not so widespread over Greece (76). In some cases the archaeologists could not find obvious physical signs that these "13th century" tombs had been re-opened prior to their own excavations. Inside, however, objects were discovered which somehow must have entered 500-600 years after the graves were sealed. At Mycenae itself we will look at one case of this "cult." It is almost a law in archaeology that, unless there is an obvious source of contamination, the latest item in a sealed context provides the earliest possible date for the deposition of all the objects. The Mycenaeans dug out, used, and blocked up Chamber Tomb 527 at Mycenae in the LH III period (i.e., the 14th-13th centuries B.C.). Among the shards blocking up the tomb was one of Geometric date (i.e., 9th-8th century B.C.). No explanation for its presence in a sealed deposit was given. Its discovery was so disturbing that it was mentioned in the report as an anomaly on three separate occasions (77). True, it is only one sherd, but how did it get into a 500-year-older, closed context (78)? The people of Mycenae dedicated a shrine to King Agamemnon, ruler of Mycenae and supreme commander of the Greek forces at Troy. While the Trojan War is now assigned to the 13th century B.C., the shrine only goes back to ca. 700 B.C. Near Sparta a similar shrine to its king and queen, Agamemnon's brother Menelaus and his wife, Helen, is of the same date (79). Did the Greeks wait until the 500th anniversary of the Trojan War to honor their leaders? Why were 8th-7th-century objects placed in 13th-century tombs? Why were 13th-century rulers honored only ca. 700 B.C.? The explanation that it was not until then that Homer composed his extremely popular epic works about Trojan War heroes (80) overlooks the fact that most ancient sources believed that Homer lived at, or very shortly after, the time of Agamemnon, Menelaus, the Greek heroes, and the sack of Troy (81 ). At Mycenae, both within and beyond the citadel was, we have seen a number of chronological riddles involving archaeology, stratigraphy, and art history. The city gate, the stratigraphical section near the gate, the source of the Grave Circles, the tombstones above and the contents within the royal Shaft Graves, the Warrior Vase in particular and Late Helladic figural pottery in general, the idols, the figurines, the tripod, the palace, the row of houses with their Linear B inscriptions and the question of literacy, models of columns in ivory, actual columns of a tomb facade, "bee-hive" tombs, old graves with new contents, and the shrine of Agamemnon were briefly examined and 500-700-year mysteries were repeatedly encountered. If, as seems to be the case, much good and no real harm will come of reducing Mycenae's dates by 500-700 years, why is this not done? The answer is quite simple. Within the buildings and tombs of Mycenae, archaeologists have discovered a number of 18th Dynasty Egyptian objects, among which are some bearing the cartouches of Pharaohs Amenhotep II and Amenhotep III and his wife, Queen Tiy (82). Some early scholars, convinced that the "Mycenaean" Age belonged 500-700 years later than it is now placed, tried to discredit these Egyptian imports as heirlooms (83). Surely the Mycenaeans did not obtain so many 500 year-old relics to the exclusion of items produced in their own time, however. While stone scarabs might conceivably be kept as prized antiques, masses of fragile pottery would not. The distinctive type of pottery found in great abundance in "Late Helladic" Mycenae is also found throughout Greece, the Aegean, and the Near East together with still more 18th and 19th Dynasty artifacts. Such pottery turns up even in Egypt itself in well-dated 18th Dynasty contexts, and was discovered in some quantity in Pharaoh Akhnaton's short-lived capital at Tell-el-Amarna. In addition to this evidence of direct imports and exports, there are quite a few cases of artistic borrowings (e.g., the inlaid daggers from Grave Circle A at Mycenae imitate inlaid Egyptian weapons of the very early 18th Dynasty). Clearly, then, the Age of Mycenae is contemporaneous with the Egyptian New Kingdom. Whatever absolute dates are assigned to the one must apply to the other. Unless and until Egyptian chronology is shortened, which is the goal of Velikovsky's revision, many 500-700 year problems will trouble Mycenae. Traveling only a short distance southeast of Mycenae we arrive at another Late Helladic center, Tiryns. Legend connected the Bronze Age hero Herakles with the site, while its fortifications, constructed of tremendous stones, were attributed to the mythical giants, the one-eyed Cyclopes. Tiryns, under the leadership of Odysseus' friend Diomedes, sent a contingent of men and ships to help regain Helen from the Trojans. Excavation of the site began in 1884, when Schliemann, the first to excavate at Mycenae, turned his attention to Tiryns. The German Archaeological Institute in a number of prolonged campaigns has laid bare much more of the site and continues the work even today. This is the second Late Helladic site whose palace "could not have been constructed in the eighth century," and the fire that gutted it "cannot be associated with catastrophes of the eighth seventh centuries B.C.," according to Stiebing (84). Before reaching Tiryns' palace, one must first pass through two monumental gate structures (propylaea) (Fig. 5: 11 and 12), built in the Late Helladic period. They, along with the entire (?) citadel, were destroyed in a violent conflagration dated ca. 1200 B.C. For centuries thereafter there is no evidence for monumental architecture in Greece, and monumental propylaea were not to re-appear until the archaic period. When propylaea do "return," however, at the Aphaia temple on the island of Aegina and on the Athenian acropolis, they are said to copy the plan of the Tiryns gates. Some scholars are quite struck by the re-emergence of a model extinct for 700 years (85). How could the later Greeks have discerned the plan of the Tiryns gates if they had been buried beneath rubble for those 700 years, in fact, until Schliemann's excavations? After passing through the second propylon at Tiryns, then crossing a courtyard (Fig. 5: 13), one reaches the palace (Fig. 5: 14). "Along one side of the porch of the large megaron [the throne room and perhaps cult center of the palace] at Tiryns was found a curious series of seven interlocking blocks of alabaster ... inlaid with blue glass paste" forming "two elongated half-rosettes with inner patterns." The blocks' "resemblance to Doric triglyphs and metopes is very striking" (86). The bench formed by these blocks is "strikingly close to the triglyph and metope pattern of the later Doric order of architecture" (87). One source sees the Doric triglyph altars as "a direct descendant" of this ritual stone bench at Tiryns (88), while another author has the entire Doric order, including triglyph and metope friezes, "invented" "in about the middle of the seventh century" B.C. (89). If the Doric altars are "a direct descendant," "how is it that we have no trace of the motif during the Dark Ages?" (90). Were such bench-altars made continuously between 1200 and 600 but only in perishable material, or did people return to Tiryns 500-600 years after it was destroyed, see, use, and then decide to copy the stone bench of the palace (91)? If there is no direct descent, no copying of an extinct model, if the idea was invented afresh in the 7th century, how does one explain the "very striking" similarity of 7th-century altars to a 13th-century bench? On the other hand, how does one explain a decorative device with no functional nature or origin (92), which, after its re-invention, "remained without variation for over four centuries" in altars and temple architecture? This fact, "it is argued, points to at least as long a period of development before its appearance in stone at the end of the seventh century" (93). Yet it is precisely the period before its appearance in stone, some 600 years, for which "there is at present no evidence to show that the Doric frieze was derived from this ancient scheme" as found at Tiryns (94). "It is not impossible that the two forms have some real historical connection" (95). While not impossible, if 600 years really separate the two forms, it is highly improbable. If 600 years did not transpire, as is the premise of the revised chronology, the similarity of the friezes is only natural and ceases to be "very striking." It has been claimed that the Tiryns bench served as the model for triglyph altars. For the use of the triglyph and metope scheme on temples, a number of Bronze Age buildings and depictions of buildings with the triglyph and rosette frieze higher up are cited as Prototypes (96). Among these structures is the Treasury of Atreus at Mycenae. The position of the triglyph scheme above the columns (Fig. 4) is particularly notable, as this arrangement of Doric-like frieze surmounting Doric-like columns is set centuries before the Doric order was "invented" in the 7th century. While this might remind one somewhat of a Doric temple facade, the chronological gap is hard to explain. We now come to a very thorny problem at Tiryns. The upper town was gutted by a fire dated ca. 1200 B.C. Did the palace on the citadel miraculously escape the conflagration? 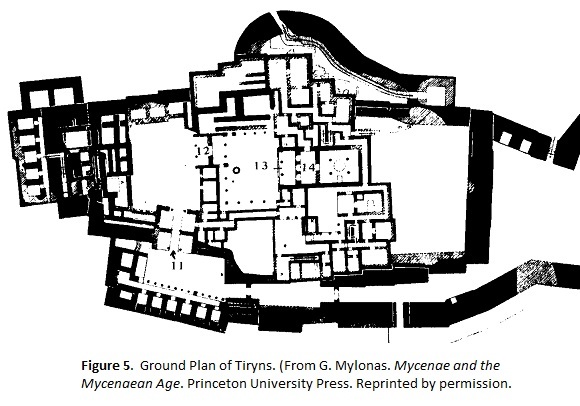 Many archaeologists have noted and been struck by the fact that the ground plan of a Mycenaean palace (especially the throne room or "megaton") is essentially the same as that for 8th-century and later temples. "How, for example, are we to explain the typical plan of the classical temple-with the two columns of the porch in line with the end walls and with the main shrine, or naos, and its central statue base-except as a carryover of the plan of the Mycenaean megaron?" (97). This could be explained very easily if there was continuity between the buildings of the 13th century and those of the 8th or 7th, but by the accepted scheme there is none. Immediately after the expiration of the Mycenaean period the "new" architecture displays an "essential discontinuity with Mycenaean architecture" (98). The change was quite abrupt (99). Now, rather than monumental, rectilinear structures, we find oval-shaped huts and apsidal buildings (i.e., with one end rounded). The latter shape, however, is not new. Just as the 8th-century temple seems to be a 500-year throwback to Mycenaean palaces, the "post Mycenaean" apsidal house seems to be a 500-year throwback to Middle Helladic buildings (100). When the 8th-7th-century temples were built, the 13th-century palace plans must have been long forgotten (101), unless some Mycenaean palace managed to survive intact until that time, or unless a ruined palace was cleared and its ground plan was then studied and copied. It is in the context of these two possibilities that Tiryns' palace becomes so important for those desiring to connect 13th-century palaces with 8th-7th-century temples (102). The palace of Tiryns has special significance for the Homericists as well. Now that Homer is assigned to the late 8th century while the destruction of the Mycenaean palaces is put in the late 13th, could Homer have been influenced by Bronze Age palaces when he describes them in his Odyssey? Since Homer is removed by 500 years from the palaces he described, "Mycenaean monuments ... will thus play no role" in any attempt to study the architecture that Homer actually knew (103). So says one archaeologist. Other archaeologists and Homericists disagree. They believe that Homer must have been familiar with at least one Mycenaean palace (104). "No better succinct description could be given of the restored palace of Tiryns" than is found in Homer's Odyssey. "Buildings combining these characteristics [enumerated by Homer] are known in Greece at one period and one only, that known as Late Helladic III, and that is the period within which the action of the Odyssey is supposed to fall. Such a degree of coincidence can hardly be fortuitous, and it is now generally agreed that some connection, however enigmatic, exists between the house of Odysseus and the Late Mycenaean palace." "The extent to which the action of the Odyssey can be adapted to the stage of Tiryns must not, however, blind us to the extreme difficulty of accounting for the knowledge which the poet apparently possessed of architecture of the LH III type" (105). "How was the knowledge of the LH III type of palace preserved?" (106). How can the palace at Tiryns help the Homeric archaeologists with their "extreme difficulty" of accounting for 13th-century details known so intimately by an 8th-century poet? How does it make the connection less "enigmatic"? How can it help the student of Greek architecture with his equally difficult problem of bridging the 500 years between Mycenaean Age palaces and 8th-century temples? On the acropolis of Tiryns a large deposit of 8th-5th-century pottery and cult objects and 7th-century architectural fragments was unearthed (107). It was thus reasonable to assume that an 8th-or 7th-century temple existed on the citadel. A suitable spot, in fact the only possible spot, was chosen. Above the megaron of the Mycenaean palace lay the walls of a somewhat smaller and less well-built structure, identified as the Greek temple. Since the temple seemed to have been built almost immediately after the palace perished in flames, and the builders were familiar with the palatial ground plan, it was decided that the palace miraculously escaped the conflagration of 1200 B.C., and continued to stand until ca. 750 B.C. when it perished to a second fire on the citadel. Above its ruins the temple was then erected. It was not only difficult for the excavators to imagine that the palace stood nearly half a millennium without alteration, but astonishing ("erstaunlich") to think that the Mycenaean elements of the palace (architectural, artistic, and stratigraphical) remained unchanged and visible to people 500 years later. Nevertheless, they felt compelled to accept this view, since the temple obviously followed immediately after the fire that razed the palace (108). If the palace of Tiryns stood 500 years longer than the other Bronze Age palaces, if it survived the fire of 1200 B.C. on the citadel and remained visible to 8th-century Greeks, then the architectural and Homeric problems are solved. The 8th-century temple builders and Homer were familiar with a 13th-century palace. The conclusions of the excavators were challenged by Carl Blegen. He agreed that immediately after the palace burned down, the smaller structure was built by men intimately familiar with the palace when it stood (109); but there was only one fire, ca. 1200, and it destroyed the palace with the rest of the citadel. Thus, to him, the smaller megaron-structure represents the remains of a 12th-century building, not a 7th century temple. In support of his contention' was the vast quantity of Mycenaean pottery around the site. He too found it difficult and astonishing to believe that the palace survived intact an extra 500 years, so he rejected the notion. Others also reject it as impossible, since the wooden beams within the walls would have rotted away long before (110). While this interpretation explains away many 500-year difficulties, it leaves the problem of the 8th-7th-century votive deposits and 7th-century architectural fragments. If this building, which followed immediately after the fire that destroyed the palace, belonged to the 12th century, where was the 7th-century temple? If the palace did not stand an extra 500 years, how can it help with the problem of the 8th-century temples copying Mycenaean palaces and with Homer's knowledge? A third solution is to have the palace destroyed in the great fire of 1200 B.C., have the site abandoned, then rediscovered and cleared in the 8th or 7th century. Those clearing the debris would see the ground plan of the destroyed palace, thus pleasing the Homericists and architecture students. A temple could then be erected on that spot after a lapse of ca. 500 years. While this view eliminates many problems and explains much of the evidence, it neglects one very important item. Both of the other schools of thought regarded it as a fact that the smaller structure was built immediately after the palace burned—500 years did not elapse between the destruction of the palace and the construction of its successor. But these are stratigraphical problems. Perhaps the architectural form of the later structure will settle the dispute over its date-12th century or 7th. Here again we find a difficulty. Its ground plan, a rectangular building with a single row of interior columns, can be found in a few structures of the 14th- 12th centuries or in a long list of 8th-6th-century buildings. No intermediate examples seem to exist to connect these two groups (111). To which group should we assign it? What should one do? For the sake of helping the Homericists and students of architecture, does one presume that the palace stood intact an extra 500 years? Does one date the later structure to the 12th century, overlook the 8th-5th-century finds and see no temple here at all, thus destroying the one hope of the Homericists and architectural historians? As a compromise, does one have a 500-year later rebuilding on an ancient site, partially pleasing, but partially displeasing both groups? This question has plagued Aegean scholars for over 50 years, has never been satisfactorily answered, and as long as 500 "ghost years" exist, it will remain "problematical" (112) and defy explanation (113). Even the objects from the temple cult, while of certain date, are "problematical." Among these were terra cotta figurines and grotesque masks of the 7th century B.C. Like so many other 7th century votive terra cottas, they were produced on the wheel "in the old technique" the Mycenaeans had used 500 years earlier (114). Such votives "kept reappearing spontaneously in widely separated parts of the country without any direct continuity that can be traced among the votive statuettes themselves. Something much more than an archaeological zeal on the part of the faithful needs to be invoked to explain this!" If we reject continuity, reject imitation of extinct models, and also reject the hypothesis that the type was preserved for centuries only in perishables now lost to us (115), what is left for us? At Tiryns we have run into 500-700 year problems with triglyphs, with propylaea, with Homer and 8th-century temple plans, with the architecture and archaeology of the palace, and with the temple votives. The fire that destroyed the acropolis of Tiryns is of approximately the same date as the great fire that destroyed much of Mycenae, including its palace. If we accept the hypothesis that Tiryns' palace was destroyed then, not 500 years later (i.e., that the palaces of Mycenae and Tiryns burned down at about the same time), what was that time? We have seen arguments for making it the 8th or 7th century B.C. We have also seen problems that crop up if we refuse to bring down the date that far. In addition to the palaces from the two sites, we have seen a number of other structures and artifacts. Are we satisfied that these two sites, whose absolute dates for the "Late Bronze Age" depend solely on Egyptian chronology, have no problems or only minor problems; that, by their undisputed contemporaneity with the Egyptian 18th Dynasty, they are so secure that they keep the Egyptian dates firmly anchored? If so, if their end "cannot be associated with the catastrophes of the eighth-seventh centuries B.C." (116), then let us flatly reject Velikovsky's reconstruction. If, however, the reader gained the impression that major chronological problems plague both sites, problems that cease to be problems under the revised chronology, let us travel across the Aegean Sea, and, like the "13th-century" kings of Mycenae, Pylos, and Tiryns, we will arrive at Troy. The Trojan War was probably the single most significant event of the Mycenaean Age. The tale, immortalized in Homer's epics, is familiar to us moderns even millennia later. For the sake of the beautiful Helen, and to avenge her husband's indignation at her kidnaping, the Late Bronze Age Greeks mounted a massive campaign. Approximately 1200 troop carrying vessels (117) were launched, and a war raged around the besieged city of Troy for 10 years (Fig. 6), until the stratagem of the wooden horse gave the Greeks access to the citadel. Once inside the city, they utterly destroyed it, slaughtering many inhabitants and enslaving all survivors who did not flee. This, at least, is the mythical account. When was that war fought? The canonical Greek calculation was 1193/2-1184/3 B.C. This number was arrived at by the 3rd-century B.C. chronographer, Eratosthenes of Alexandria, who apparently relied on the calculations of Ctesias and on Manetho's Egyptian king-lists. Ctesias, a late 5th-century author, is today viewed as "an amusing liar" (118) and "an ancient red herring" (119). Manetho's lists are the basis for modern calculations for Egyptian chronology. They are convincingly challenged by Velikovsky (120). The archaeologists also have a date for that war, ranging sometime between ca. 1260 and 1200 B.C. (121). This date is assigned to a conflagration layer (stratum VIIA) at the site of Hisarlik in Northwestern Turkey, which, in the excavator's opinion, marks the Greek destruction of Troy. The date depends on the time of the Mycenaean pottery found in this layer. That in turn is based solely on Egyptian chronology (122). Thus, if the Egyptian scheme is off, both the Greek calculations and the archaeological date must be changed. It is a simple task to show that the Greek calculations are of no worth and that the Greeks themselves made the Trojan War contemporaneous with many events that we now know to be of the 8th century B.C. Elsewhere I will show this in some detail. Only the archaeological problems will here concern us. 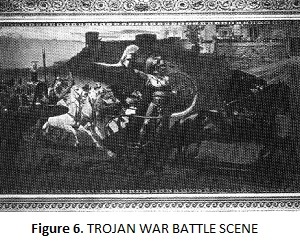 It is conceded that no artistic representations of any event connected with the Trojan War appear before the 8th century B.C. (123). We have already seen that cults to the Greek leaders of that war do not seem to have sprung up until then. Homer is invoked to explain both these and many other phenomena, but Homer was almost universally regarded by the ancients as composing his epics very shortly after Troy's fall (124). Since Stiebing doubts that Velikovsky can bring down the date of the Trojan War (125), we shall examine the archaeological findings from Hisarlik to see why they were assigned an early date, and whether the stratigraphy and other archaeological considerations support a 13th-century date for the great war. The Homeric problem and mythical matters relating to the war await discussion until another time. Just as at Mycenae and Tiryns, the first large-scale excavation of the site was undertaken by Heinrich Schliemann in the 1870's-1890. His collaborator, Wilhelm Dörpfeld, continued the work after Schliemann's death in 1890. From 1932-1938, yearly excavation of the site was undertaken by an expedition from the University of Cincinnati. Their findings, published in final form in the 1950's, provide the principal scientific data about the site. Nine major habitation levels, ranging from the Early Bronze Age (stratum I) to Roman times (stratum IX) were distinguished, of which only levels VI-VIII will concern us. As was pointed out in my earlier paper, the 8th-century Phrygians, who, according to Homer, were allies of Troy during its siege, copied the architectural style of the fortifications of Troy VI when they built their great gate at Gordion. Since the end of Troy VI is put at ca. 1300 B.C., its walls must have been buried by 500 years of debris, making them invisible in the 8th century. The excavator of Gordion, faced with this 500-year problem and no intermediate examples, still saw close similarities and was hard pressed to explain them (126). A house of Troy VI, destroyed in the great earthquake that leveled the site, assigned to ca. 1300 B.C., is of the same type as buildings beginning in the 8th century B.C. after a supposed break of centuries during which no similar houses are known (127). The end of the sixth layer of Troy is dated by the presence of Mycenaean pottery, which, in turn, receives its place in time from Egyptian chronology. Between the 7th and 8th strata of Hisarlik, it is said that 400 years transpired, during which the site was "a ghost-town in the gloom of the Dark Ages of the ancient world...... There is nothing at Troy to fill this huge lacuna. For 2000 years men had left traces of their living there; some chapters in the story were brief and obscure, but there was never yet a chapter left wholly blank. Now at last there is silence, profound and prolonged for 400 years; we are asked, surely not in vain, to believe that Troy lay 'virtually unoccupied' for this long period of time" (128). Why are we asked to believe this? The eighth settlement began ca. 700 B.C. The seventh, however, contained Mycenaean pottery, which, of necessity, should be centuries earlier. At a tell such as Hisarlik one would expect a layer of wash and/or humus to mark this 400-year abandonment (129). There is none. Recalling the legend of Troy, we would hardly object to an abandonment after the Greek sack of that city; it would be only natural, and is, in fact, attested in ancient sources (130). But the settlement said to mark the Trojan War is VIIa, and we are here dealing with the second sub-stratum above this, VIIb2 (131). Why should people who tenaciously remained on the site for 2000 years, despite fires, earthquakes and all-out war, abandon the town now? Was there another sack of the city, this time more devastating than the earlier destruction by the Greeks, yet, unlike its predecessor, lost forever to human memory (132)? Let us examine this 400-year gap in some detail. Was the end of settlement VIIb2 marked by a destruction layer so intense that abandonment could be rationalized? Reading the official publication of the most recent excavation, we find that it was not known what caused the end of stratum VIIb2 (133). If there is no sterile layer marking the desertion and no obvious cause for such action, we are certainly justified in asking if the site really was abandoned. If level VIII immediately overlay level VII, why could it not have begun immediately after the end of VII? The answer is that Troy VIII began in the early 7th century B.C. 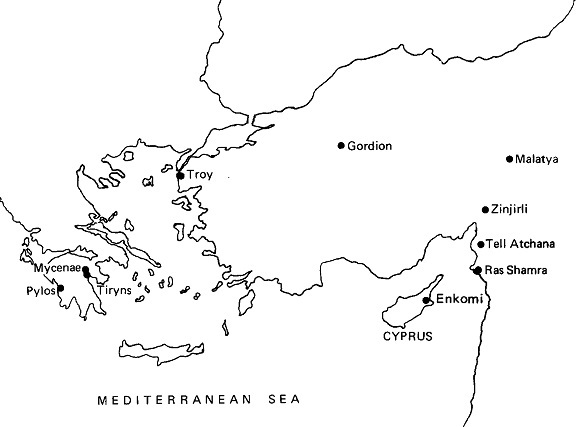 while Troy VI and VII contained Mycenaean pottery. Between VII and VIII "some four centuries must have elapsed" (emphasis added) (134). If, by redating Egyptian chronology, we reduce the age of Mycenaean pottery by centuries, could Troy VIII have followed immediately after Troy VII without any gap? Surprisingly, perhaps, for those accepting the old chronology, such a revision fits the circumstances of the two layers. In 1893 Dörpfeld, the great German excavator of Troy, more interested in stratigraphy and architecture than in pottery, treated Troy VII and VIII as a single unit, and, in some cases, could not differentiate between the two phases (135). With the results of over 20 years of excavations before him and an additional 8 years to reflect on matters, he still had Troy VIII follow immediately after Troy VII, and, at times, noted the presence in Troy VII of the 7th-century pottery characteristic of Troy VIII (136). Dörpfeld assigned the task of analyzing the pottery from all levels of the site to Hubert Schmidt. Schmidt noted obvious Greek wares in level VIII, marking a Greek colonization, while the material from layer VII seemed to represent a different culture. He nevertheless placed VIII immediately after VII. Noting Mycenaean imports in Troy VII, he still put this layer at ca. 1000-700 B.C., rather than 500 years earlier (137). These were early excavators and could be forgiven for their opinions as they did not know any better. Egyptian chronology had not yet established firm absolute dates for Mycenaean pottery (138). What did the modern excavators find? After completing seven seasons of excavation at Troy, Carl Blegen, the chief archaeologist of the Cincinnati expedition of the 1930's, saw no break between layers VII and VIII (139). After several more years had elapsed, allowing additional time to reflect on the dig, to study the pottery more carefully, and especially after Mycenaean pottery dates became more firmly entrenched (140), it was realized that a gap of centuries should exist between the two layers. Nevertheless, even in their official publication, the excavators were so impressed by certain facts relating to the mound itself that they left open the possibility that there was no gap (141). By the accepted chronology there had to be a lacuna, as they acknowledged, but they hesitated on this point. Their reasons are interesting. The new excavations showed that the locally-made pottery of Troy VIII was "obviously akin" to that of Troy VII (142). The local grey ware pots of Troy VII (i.e., of the Mycenaean Age) were looked upon as the "direct ancestors" of the local ware not only of Troy VIII but also of 7th-6th-century Northwestern Turkey and the off-shore island of Lesbos as well (143). With a 400-year gap in the evidence, how can one connect this widespread 7th-6th-century ware with that of the Mycenaean Age? At the very time that there was supposed to be a 400-year abandonment of Hisarlik, one house seemed to show continuity between the end of layer VII and the time of VIII, as if no one had left and only a few years had passed (144). In several deposits of Troy VIII there were sherds from Troy VII (145). There was finally, however, a more serious problem. Although the excavators were meticulous in their method of digging stratified layers and labelling and recording all finds and their provenience (146), in sub-strata of Troy VII that seemed to be undisturbed, sherds were found of the imported Greek pottery of the early 7th century (147). "The only explanation we can find is to suppose that, in spite of our efforts to isolate and certify the deposits we examined, contamination had somehow been effected and brought about the intrusion of the later wares into strata of Troy VIIb" (148). The discovery of these 7th-century sherds "in several areas in the strata of Troy VIIbl" stratified below layer VIIb2, which is supposed to represent the 12th century, "presents a perplexing and still unexplained problem" (149). After all the digging by Schliemann, Dörpfeld, and Blegen at Hisarlik, only one sherd has turned up which could conceivably fall within the 400-year gap postulated for the site. Stratigraphically, however, it was not found where it should have been. A rim fragment from a "Proto geometric" cup was found "with sherds of Phase VIIbl, but probably out of context." The reason it was probably out of context is that it was covered over by "two successive buildings of Phase VIIb2" (150) which of necessity belong to the 12th century B.C. The sherd beneath those two buildings is seen as part of a body of material found from Palestine to Macedonia (151) which, beginning perhaps ca. 900 B.C., was in vogue until the 8th or 7th century B.C. (152). It is stratigraphically impossible to have a 7th, 8th, or even 9th-century B.C. item below the floor of a 12th-century B.C. building, unless contamination occurred. "There was apparently no contamination from disturbance or later intrusions," however (153). In time these "perplexing and still unexplained" problems were brushed aside, and reservations about a 400-year gap were abandoned, because, by the accepted chronology, that gap had to exist. All the work of the excavators, their failure to detect any physical sign of abandonment, their belief that Troy VII ended immediately before Troy VIII began (i.e., sometime around 700 B.C. ), their detection of continuity of culture, their discovery of a house that seemed to span the ghost years, their finds of "12th-century" pottery just beneath or mixed in with 7th-century strata, their finds of 7th-century pottery in and sometimes under "12th-century" layers which seemed undisturbed (a situation quite similar to but more disturbing than what we saw for the stratified section just inside Mycenae's Lion Gate), the opinions they held, the problems that upset them all became secondary to making the evidence fit the accepted chronology. Archaeological facts were forced to fit a historical theory. Then a new theory was needed. If there was indeed a 400-year gap, something must have caused it. The cause for the end of layer VIIb2 was unknown when no gap was seen (154), but when the gap became necessary, it was decided that Troy VIIb2 must have perished by fire and sword more terrible in their effect than the Trojan War which ended Troy VIIA (155). Why else would people too stubborn to leave despite 2000 years of great hardships abandon their site now? Only revision of the Egypto-Mycenaean dates can explain the "still unexplained" problems at Hisarlik. Only then do they cease to be "perplexing." We now leave Asia Minor's northwest coast and travel to the area where its south coast meets northern Syria. Here we find Ugarit and Alalakh, two ancient city-states cited by Stiebing in his criticism of the revised chronology (156). In the published volume of Ages in Chaos, Velikovsky has already made a strong case for challenging Ugarit's conventional dates (157). He points out many 500-year problems in the literary texts uncovered at the site, and shows the difficulty relating to vaulted Cypriote tombs constructed in the style of those from Ugarit but set 500 years later. Stiebing seems to ignore this section of Ages in Chaos when he informs us that "the destruction of Ugarit cannot be associated with catastrophes of the eighth-seventh centuries B.C." (158). For those who have not read or were not already convinced by the material presented by Velikovsky for Ras Shamra-Ugarit, perhaps a couple of additional problems will suffice. Let us again look at the vaulted tombs of Cyprus. Velikovsky has already mentioned some of these, especially the 7th century example from Trachonas. The island of Cyprus has an "astonishing" number of these tombs (159) which divide neatly into two series: those assigned to 1550-1200 B.C., and those beginning in 950 B.C. and continuing for some time (160). The first group of vaulted tombs (at Enkomi) corresponds closely in date and style to the Ugaritic tombs, and the type is thought to have come from Syria to Cyprus (161). The second group of Cypriote tombs corresponds to both the Ugaritic and earlier Cypriote examples, but a 250-year gap separates the inception of the second group from the end of the Bronze Age tombs. More important than the 250-year period when no tombs were built in Syria or Cyprus to connect the later tombs to the earlier ones, is the fact that the earliest tombs of each group (i.e., those of 1550 and 950 B.C. ), separated by 600 years, are most similar (162). The Cypriote vaulted tombs from 950-600 B.C. seem to undergo the same development as the Enkomi and Ugaritic tombs with 600 years separating the corresponding phases. It has been postulated that the later tombs somehow copied the earlier Cypriote or Syrian ones, but the tombs presumably copied must have been buried and invisible for some 600 years (163). Similar tombs are found in Jerusalem, Asia Minor, and Urartu of the 9th-7th centuries, and again it is thought that they originated in 9th-7th-century Syro-Phoenicia (164). But the only tombs of this type in that region, notably the ones from Ugarit, are placed centuries earlier. Leaving behind the regions bordering Syro-Phoenicia, we shall travel briefly to an actual Punic colony. In the 9th or 8th century B.C. (165), a group of Phoenicians sailed to North Africa and founded Carthage. One of the oldest archaeological discoveries from the site is a late 8th-century B.C. built tomb "closely related" to the Ugaritic tombs in architectural plan (166). It is a "faithful miniature rendering" of the Syrian tombs both in design and, apparently, in arrangements for religious rites (167). It would hardly be surprising for 8th-century Phoenician colonists to bring over a current tomb type and burial customs from their motherland. The only similar tomb type and burial customs that their motherland can produce, however, are put 500 years earlier. By the accepted scheme, the colonists' ancestors would have been very familiar with these matters, but by the 8th century B.C., the Ugaritic tombs must have been buried over, invisible, and forgotten (168). How did these tombs of Ugarit serve as models for Cypriots, Israelites, Urartians, Anatolian peoples, and Phoenician colonists, if contemporaneity is denied, and they went out of use and were thus forgotten 500-600 years earlier? 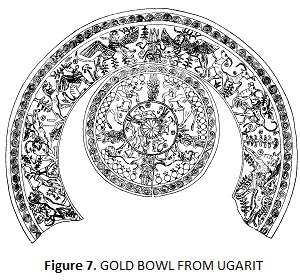 The final items we will examine from Ugarit are a gold bowl and a gold plate, both beautifully decorated. Stratigraphically, they belong shortly before the destruction of the city during the Amarna period, and are thus assigned a date somewhere between 1450-1365 B.C., (169). Stylistically, as well, they belong to the Mitannian-Amarna period and show scenes reminiscent of late 18th Dynasty Egypt, notably the time of King Tutankhamon (170). Both stratigraphically and stylistically, then, a late 18th Dynasty date is necessitated. Since Velikovsky lowers that date by over 500 years, how are the gold bowls affected? These two pieces are called "remarkable antecedents of the use of the frieze of animals on metal bowls" of Phoenician workmanship, firmly dated to the 9th-7th centuries B.C. (171). What is more "remarkable" than the Ugaritic examples' manufacture and burial over 500 years before the "later" series began, is the subject matter of the two items. Extraordinary conservatism was attributed to the Phoenicians, since the later group faithfully reproduced similar scenes and arrangement of the decoration (172), after a lapse of 500 years. The chariot scene on the 14th-century gold plate is compared to similar scenes of the 9th-century Neo-Hittites and of the Assyrian King Assurnasirpal II (883-859 B.C.) (173). The elongated gallop of the horse is seen to be quite similar to depictions on Assyrian reliefs, but Assyrian influence "is chronologically impossible, all the Assyrian monuments presently known where horses are depicted at gallop being about half a millennium later than our plate" (174). The gold bowl (Fig. 7) with its combination of Aegean, Egyptian, Mesopotamian, and Levantine motifs is "an excellent example of Phoenician syncretism, half a millennium before Phoenicians in the proper sense are known"(175). Surely, it was thought, these golden objects, remarkably foreshadowing by 500 years similar metal bowls and similar scenes, "may be claimed as ancestors of the series of 'Phoenician' bowls of the ninth-seventh centuries B.C." (176). How can they be ancestors if they were buried and unseen for 500 years before the later series began, and the art was lost over those 500 years? If metal bowls reproduced similar scenes in similar arrangements for 500 years, that would indeed be "extraordinary conservatism." That 9th-7th-century Phoenicians should imitate so closely 14th-century bowls they never saw, after a 500-year gap, is merely "extraordinary." When their date is reduced by half a millennium, these bowls fit beautifully into the later series. If one keeps high dates for the Mitannians and the 18th Egyptian Dynasty, then this is yet another mystery to add to our list. Traveling a bit farther inland and to the north, one reaches Tell Atchana, the ancient Alalakh, another site employed by Stiebing in challenging the revised chronology. The uppermost levels VI-I of the site, the ones of most concern to us, depend solely on Egyptian chronology, and the dates for imported Late Cypriote and Mycenaean pottery, Hittite New Empire and Mitannian material (177). The four latter sets of material owe their dates solely to Egyptian chronology, and maintain them by floating on mysterious Dark Ages, which are archaeologically empty, or, at best, very obscure. It is thus an easy matter to find some 500-600-year puzzles of the type met over and over again in this paper. For the sake of brevity we will treat here only two. During part of the period of the 18th Egyptian Dynasty, Alalakh was ruled by King Niqmepa. His royal palace is thus assigned to the 15th-14th centuries B.C. Only a short distance north of Alalakh lies the site of Zinjirli with its 8th-century palace. According to H. Frankfort there are no monuments, in fact, no works of art to fill the gap between ca. 1200 and 850 B.C. in this part of the ancient Levant. He was nevertheless struck by the resemblances of the 8th-century palace of Zinjirli to the 14th-century palace of Alalakh (178). How was the tradition of monumental architecture kept alive for 600 years, if the Niqmepa palace was covered over and invisible by the 14th century, and if there is absolutely no continuity in this or any of the other arts between the two periods (179)? Many large fragments of sculpted stone lions were also unearthed at Alalakh. These were found re-used in the last phase of the "temple" (180), but presumably guarded the doors to this structure at an earlier date. According to the excavator (181), these lions have great "importance as monuments for the history of art. In the 'Syro-Hittite' period gateway lions of this sort are so regular a convention as to be almost the hall-mark of North Syrian art." Such lions are normally assigned to the 9th-7th centuries B.C. (182), but because Egyptian chronology provides the absolute dates for Alalakh, "now for the first time we have a series of lion sculptures which cannot be later than the fourteenth century B.C." Should we view the Alalakh lions as "early forerunners of the whole series of Syro-Hittite lions" (183)? Were they also the model for the guardian lions of Assyrian palaces, "anticipating [both sets] by five hundred years" (184)? Could they have provided the inspiration for the 500-year-later sculptures? If, by the 9th century B.C., the Alalakh lions were completely buried over by debris and long forgotten (185), and no similar lions exist to span the Dark Age in this region, "how can we explain why the system of flanking gates with large, guardian figures and stone reliefs in the ninth-century Assyrian palaces resembles so much that employed" (186) here at Alalakh and other contemporary centers some 400-500 years earlier? Alalakh and Ugarit, rather than providing a firm base upon which the traditional chronology can rest and from which the revised scheme can be attacked, offer major problems of their own for the old scheme but confirmations for the new. In this paper the reader has traveled to five ancient cities to study some of the buildings and artifacts that modern excavators have unearthed. These five places were referred to as stumbling blocks for the revised chronology. We were told that they could not come down by centuries in time, thus the revised chronology, a nice enough theory, was disproved by archaeological facts. What did we see? At Mycenae, Tiryns, Troy, Ugarit, and Alalakh, we found numerous 500-700-year problems for the excavators and for those trying to trace the development of artistic and architectural types. We have examined palaces, temples, tombs, pots, pins, carved slabs, bowls, figurines, etc. We have come across stratigraphical sections that do not conform to the expected and accepted sequence of events. Everywhere we went we found unanswered questions, perplexing problems, and always these involved 500-700 years. In this article only five places were visited, and these but briefly. The number of 500-700-year problems studied by this writer is quite large, and the more he reads, the greater the number swells. No ad hoc theory has yet been advanced which adequately explains any one of the cases, let alone all of them. Only a revision of ancient history, a shortening of Egyptian chronology, works for all the cases mentioned in this paper, and, in fact, for all others which this writer has researched. If there were no problems, or only a couple of minor points not yet fully understood, it would be simple, indeed necessary, to accept the standard chronology. When, however, major "exceptions to the rule" appear in great numbers, and these form a consistent pattern (187), it becomes very difficult to brush them aside and have faith in "the rule." One must make a choice. Should archaeological evidence be forced to fit the Procrustean bed of historical theory, or should a new scheme be put forth to explain all the facts? A few problems from a handful of sites do not prove that the revision is valid. Volumes could and need to be written to enumerate all the problems faced by the old scheme, which act as confirmations for the new. One article need not convince the skeptical reader that Velikovsky is right, but anyone reading this might start wondering: Just how sound is the accepted chronology? To those friends, colleagues, mentors, relatives, and strangers who helped to prepare, proofread, correct, and improve this article, I wish to express my sincere thanks and appreciation. (1) W. H. Stiebing, Jr., "A Criticism of the Revised Chronology," Pensée (Fall, 1973): 1012. (Henceforth Stiebing). The revised chronology is outlined in Velikovsky's "Theses for the Reconstruction of Ancient History," Scripta Academica Hierosolymitana (New York: 1945). The theses are expanded and elaborated upon in the series Ages in Chaos, only the first volume (Garden City, New York: 1952) of which has been published. (4) Two points raised by Stiebing, the impossibility that Ipuwer and Hammurabi could be contemporaneous with Moses, and the problems of Biblical archaeology, require answers too detailed to be treated at this time. In the future, I hope to show why Hammurabi is now dated to the 18th or 17th century B.C., and how that date can, and, in fact, needs to be lowered significantly. I will also treat the Middle Bronze Age fortress-cities of Palestine and attempt to show that their destruction, misattributed to Pharaoh Ahmose or the Hyksos fleeing from him, marks the entrance into Canaan of the Hebrews under Joshua. Stiebing's remarks about Samaria, Mycenaean pottery, and Egyptian scarabs in the Near East, etc., are best delayed at present, but will be answered in an article on the pitfalls of Palestinian archaeology. (6) By the accepted chronology the Mycenaean Age is contemporaneous with the 20th Dynasty as well. This is not adequately demonstrated by subscribers to the old chronology and impossible according to the revised scheme. By the revised scheme the Mycenaean Age is also contemporaneous with the 22nd-25th Dynasties of Egypt which intervene between the so-called 18th and 19th. (7) I. Isaacson, "Carbon 14 Dates and Velikovsky's Revision of Ancient History: Samples from Pylos and Gordion," Pensée (Spring-Summer, 1973): 26-32. (8) Pensée (Winter, 1973): 26-31. (9) J. Boardman, Greek Art (New York: 1964), p. 22. (10) A. D. Lacy, Greek Pottery in the Bronze Age (London: 1967), p. 221. (12) See A. J. B. Wace, "The Lion Gate and Grave Circle Area,"ABSA 25 (1921-23): 34-36, and Fig. 4, p. 19. If people continued to enter and leave Mycenae between the 12th century and the 7th, the pottery representing those 500 years would be expected in this trench. If the site was abandoned for 400 years, wash, consisting of ashes and dissolved mud brick from ruined structures on the citadel would be expected, as the trench was dug in a perfect sedimentation trap, an area enclosed by three walls with the fourth side open to the steeply sloping ground of the citadel. (13) One could conceivably propose that the 11th stratum was deposited in the 7th century, and that it contained much pottery 500 years earlier in date, but that would merely move the problems down a layer (i.e., 500 years' worth of pottery and/or wash should be present between layers 10 and 11). The most telling argument against this, however, is that Wace ("The Lion Gate," p. 34) claimed that the 11th layer was "the last true Mycenaean stratum," (i.e., it followed immediately after the 10th). In fact, this stratum contained an LH IIIC burial within it. The IIIC style was rather short-lived. No one would have it last from 1200-700 B.C. As we shall see below, many scholars once dated LH IIIC pottery stylistically to the 7th century B.C., and placed the Geometric pottery (now sandwiched between LH IIIC and the 7th century) before LH IIIC, making it contemporary with earlier Mycenaean wares. This stratigraphical section as well as others, tends to support their conclusions based on stylistic criteria. (14) G. E. Mylonas, Mycenae and the Mycenaean Age (Princeton: 1966), p. 236, assigns them to ca. 1650-1 510 B.C. (15) N. G. L. Hammond, A History of Macedonia I (Oxford: 1972), p. 275. (16) N. G. L. Hammond, "Tumulus-Burial in Albania, The Grave Circles of Mycenae, and the Indo-Europeans," ABSA 62 (1967): 90. (17) N. G. L. Hammond, Epirus (Oxford: 1967), p. 343. (18) N. G. L. Hammond, "Tumulus-Burial," ABSA (1967): 91. See also his "The Dating of Some Burials in Tumuli in South Albania," ABSA 66 (1971): 229-41, and "Grave Circles in Albania and Macedonia" in Bronze Age Migrations in the Aegean, ed. by R. Crossland and A. Birchall (London: 1973), pp. 189-95. (19) For the opinion of F. Prendi and other excavators of these tombs, see Hammond, "The Dating of Some Burials," ABSA (1971): 231, 240-41, and his references to the Albanian publications. (20) A. M. Snodgrass, The Dark Age of Greece (Edinburgh: 1971), pp. 172-73, 257-61. (21) In this brief account I cannot go into specific details. Hammond's points about the assigning of pots and certain metal objects, especially weapons, to the Middle/early Late Bronze Age are not adequately answered by Prendi and Snodgrass. Of course, if the 18th Dynasty were moved down by ca. 500 years, and along with it the Grave Circles of Mycenae, there is no problem. (22) See G. Karo, An Attic Cemetery (Philadelphia: 1943), pp. 10-11; K. Friis Johansen, The Attic Grave-Reliefs of the Classical Period (Copenhagen: 1951), pp. 65-66; and D. C. Kurtz and J. Boardman, Greek Burial Customs (London: 1971), p. 38. G. Richter (The Archaic Gravestones of Attica [London: 1961], pp. 1-2) and M. Andronikos (Totenkult, Archaeologia Homerica IIIW [Göttingen: 1968], pp. 116-18) do believe that there must be a connection between the 16th-century stelae of Mycenae and the 10th-century examples from Greece. Richter cites Friis Johansen as the source of her belief, when he, in fact, clearly states that there is no connection, while the examples of continuity cited by Andronikos were, for the most part, disposed of by Friis Johansen. Certain of Andronikos' examples are not from the Greek mainland anyway. (23) The Orientalist, Prof. A. H. Sayce, noted this "phenomenon" over 90 years ago. See "The Inscriptions Found at Hisarlik," an appendix to H. Schliemann's Ilios, the City and Country of the Trojans (New York: 1881), p. 700. Note remarks by L. M. Greenberg, "The Lion Gate at Mycenae," Pensée (Winter, 1973): 28. Compare the stele over the 5th Shaft Grave of Circle A (ABSA 25 [1921-23], pl. XIX) with M. Vieyra, Hittite Art 2300-750 B.C. (London: 1955), pls. 48, 66, 67, 77. (24) Vieyra, Hittite Art, pl. 66 and ABSA 25, pl. XIX. Sculptures of the early 9th-century Assyrian King Assurnasirpal show some affinity to the Shaft Grave stelae but are of much finer execution (see R. D. Barnett and M. Falkner, The Sculptures of Assur-Nasir-Apli II [883-859 B.C. ], etc. [London: 19621, pi. XVI, and E. A. Wallis Budge, Assyrian Sculptures in the British Museum: Reign of Ashur-Nasir-Pal, 885-860 B.C. [London: 1914], pls. XII, XLII). (25) "Notes on Art and Archaeology," The Academy vol. 42, No. 1069 (29 October 1892), p. 393, remarks by Prof. Heuzy. See C. Smith's cogent comments in "Egypt and Mycenaean Antiquities," The Classical Review 6 (1892): 463-64. This relief (apparently the same as that referred to in note 24 above, i.e., Vieyra, Hittite Art, pl. 66) does display a scene similar to the gold ring (H. Schliemann, Mycenae [New York: 1878], p. 223, No. 334) but is more analogous to the grave stele notes 23, 24 above) than the ring. (26) See the book review of Schliemann's Mycenae in the Quarterly Review No. 145 (Jan.-April, 1878): 78. (28) See, for example, C. Schuchhardt, Schliemann's Excavations, trans. by E. Sellers (New York: 1891), pp. 180, 318. It is not the intention of Velikovsky or myself to assign these objects or graves as late as the 7th-6th centuries. By the revised chronology they belong in the 11th-10th. The vast gap, which exists between the Shaft Graves and the 7th century according to standard reckoning, is narrowed considerably by this revision, and the artistic lacuna between the two periods is eliminated. (29) H. R. Hall, The Oldest Civilization of Greece (Philadelphia: 1901), p. 16. (30) Ibid., p. 229. On p. 16 Hall wanted to assign certain objects to the 8th-7th centuries. (31) Hall himself later rejected the theory (Aegean Archaeology [London: 1915], pp. 23-24). I hope to tell of his rather dramatic turnabout at a later date. Accepting 9th-7th century dates for items from Enkomi on Cyprus, and convinced of their contemporaneity with some Shaft Grave artifacts, he sought to down-date the latter by over 500 years, but, after being convinced that that was impossible, he added over 500 years to the date of Enkomi material. (32) Mylonas, Mycenae and the Mycenaean Age, p. 236. (33) R. Carpenter, Discontinuity in Greek Civilization (Cambridge, England: 1966), p. 35. (34) See note 29 above. (35) P. Jacobsthal, Greek Pins (Oxford: 1956), p. 1, n. 1. (36) F. Dümmler, "Bemerkungen zum ältesten Kunsthandwerk auf griechischem Boden," Athenische Mittheilungen (henceforth Ath. Mitt.) 13 (1888): 291, and E. Pottier, "Observations sur la céramique mycénienne," Revue Archeologique 28 (1896): 20-21. A reply to Dümmler came from D. Mackenzie ("Cretan Palaces and the Aegean Civilization III," ABSA 13 [1906-7]: 433), who maintained that this vase provides evidence that such a handle "had a much earlier history." (37) E. Pottier, "Observations," pp. 19-23; H. B. Walters, History of Ancient Pottery, vol. I (London: 1905), pp. 297-98. (38) E. Pottier, "Observations." Not all of these considerations are valid for dating purposes. (39) S. Marinatos and M. Hirmer, Crete and Mycenae (New York: 1960), pls. 232 and 233 and captions; A. D. Lacy, Greek Pottery, p. 224. (40) J. N. Coldstream, Greek Geometric Pottery (London: 1968), p. 357. (41) O. W. von Vacano, The Etruscans in the Ancient World, trans. by S. Ogilvie (Bloomington: 1965), p. 81, and see p. 88. (43) Life was so much simpler for the archaeologist and art historian in the "good old days" before the end of Mycenaean civilization was so firmly entrenched in the second millennium B.C. Archaeologists had the 7th-century pottery follow immediately after the Mycenaean without a 500-year gap, and saw the Geometric style, now placed between the two, as a contemporary, not intervening, style (see A. Furtwängler, "Die Bronzefunde aus Olympia und deren Kunstgeschichtliche Bedeutung," Berlin Abhandlungen 4 [1879): 45-47 (reprinted in Kleine Schriften 1 : 373-75); F. Dümmler, "Zu den Vasen aus Kameiros" Jahrbuch (of the German Archaeological Institute) 6 (1891): 270-71; A. S. Murray, Excavations in Cyprus (London: 1900), p. 23; and W. Dörpfeld, "Das Alter des Heiligtums von Olympia," Ath. Mitt. 31 (1906): 205-18. Dörpfeld, instead of bringing down the Mycenaean style, pushed back the Geometric. This view was attacked by Furtwängler in a very caustic manner in "Das Alter des Heraion und das Alter des Heiligtums von Olympia" in 1906 (reprinted in Kleine Schriften, pp. 455-57), but was maintained by Dörpfeld as late as 1935 in Alt Olympia I (Berlin: 1935), pp. 11-14). For modern comments on this attempt to connect 7th and 12th-century pottery see P. Demargne, The Birth of Greek Art, trans. by S. Gilbert and J. Emmons (New York: 1964), p. 271, and R. M. Cook, Greek Painted Pottery, 2nd edition (London: 1972), p. 310. I hope to deal extensively with this matter at a later date. For recent attempts to grapple with the problem see J. L. Benson's Horse, Bird & Man (Amherst: 1970), and the review of this book by K. De Vries in American Journal of Archaeology (henceforth AJA) 76 (1972): 99-100. (44) See Lord William Taylour, "Mycenae, 1968," Antiquity 43 (1969): 91-97, and "New Light on Mycenaean Religion," Antiquity 44 (1970): 270-80 for a highly readable account. The results of some radiocarbon tests performed on material from this building will be treated in the near future in an article in this journal. (45) Taylour, "Mycenae, 1968," p. 92. (46) R. V. Nicholls, "Greek Votive Statuettes and Religious Continuity, ca. 1200-700 B.C." in Auckland Classical Essays Presented to E. M. Blaiklock, ed. by B. V. Harris (New Zealand: 1970), p. 3. (47) Taylour, "Mycenae, 1968," p. 92. In his article of 1970 he dates the fire that destroyed the building containing the idols to ca. 1220 ("New Light on Mycenaean Religion," p. 276), so they should predate 1220 B.C. (48) Nicholls, "Greek Votive Statuettes," pp. 17-18. Even the "intermediate" examples from elsewhere in Greece seem too few to bridge the gap. (49) Taylour, "Mycenae, 1968," pl. XIIId, and caption. (50) Ibid., p. 92. Actually, a much better example of this sort of thing is to be found on the youthful "horned god" from Enkomi on Cyprus. Also found in a building said to have been destroyed ca. 1200 B.C., this bronze statuette betrays many features of archaic sculpture. In fact, were it not found in a "Mycenaean" context, it would have been attributed to the 6th-century Arcadian school of Greek sculpture. An interesting article on this topic is K. Hadjioannou's "On the Identification of the Horned God of Enkomi-Alasia" in Alasia I (Paris: 1971), pp. 33-42. (51) A. J. B. Wace (Mycenae: An Archaeological History and Guide [Princeton: 1949], pp. 85-86) identifies the sculptural fragments as part of an altar. He believed that the 7th or 6th-century temple underlay the later Hellenistic one (Fig. 1, M), which he considered to be located above a Mycenaean cult center. The altar would thus rest south of the temple. G. Mylonas (Ancient Mycenae [Princeton: 1957], pp. 63-64), however, shows that while we know the location of the Hellenistic temple, the archaic temple's site is unknown. He further states that the room beneath the later temple was probably not a cult center, and would have been hard to find after several hundred years, as it was a heap of rubble by that time. A more likely spot for a 7th-century temple, as we will see at Tiryns, would be above the megaton of the palace, probably utilizing the old walls. If that were the case here, the altar would lie west of the temple. (52) C. W. Blegen, "A Mycenaean Bread-maker," Annuario (of the Italian School of Archaeology in Athens), New Series VIII-X (1946-48), p. 16 and footnotes 1-4. For another example of exactly the same thing cp. the two terra cotta heads from Amyclae (see R. A. Higgins, Greek Terracottas [London: 1967],p.24, and references p. 141). (53) A. M. Snodgrass, Dark Age of Greece, pp. 281-83. (54) See for example E. H. Hall, Excavations in Eastern Crete, Vrokastro (Philadelphia: 1914), pp. 132-3 5; W. Lamb, Greek and Roman Bronzes (New York: 1929), p. 44; S. Benton, "The Evolution of the Tripod-Lebes," ABSA 35 (1934-35): 76-77. (55) Snodgrass, Dark Age of Greece, pp. 281-85. (56) These have been named, from North to South: the House of Shields, the House of the Oil Merchant, and the House of Sphinxes. (57) G. Mylonas, Mycenae and the Mycenaean Age, p. 83. (58) A. J. B. Wace, "Preliminary Report on the Excavations [at Mycenae] of 1953," ABSA 49 (1954): 243. For our purposes it is of special interest to note that, while we date the adoption of the Phoenician alphabet to the 8th century or perhaps a bit earlier, the Greeks themselves attributed its introduction to Cadmus, a pre-Trojan War hero. J. D. Muhly's attempt ("Homer and the Phoenicians,"Berytus 19 : 38-41) to dissociate Cadmus' introduction of writing from a pre-Trojan War date fails to take into account the belief of Herodotus (Book V, 58-61) that certain early Greek inscriptions at Thebes, which he was able to read and were thus no older than the 8th century B.C., belonged to the period of and just prior to the Trojan War. In the present paper we will see some reasons to doubt an early date for that war, and will also see the source of Herodotus' confusion and how it adds to our own. (59) A. J. B. Wace, "Foreword" to M. Ventris and J. Chadwick's Documents in Mycenaean Greek (Cambridge, England: 1956), p. xxviii. (60) G. F. Else, "Homer and the Homeric Problem," Lectures in Memory of Louise Taft Semple, ed. by D. Bradeen, et at. (Princeton: 1967), p. 342. The lecture was delivered in 1965. (61) Wace wanted the Greeks to write in the Linear B script until the less cumbersome Phoenician alphabet was introduced (see reference in notes 58-59 above). With a centuries-long gap, that is clearly impossible. An attempt to plug the gap was made by proposing that all writing in Linear B after ca. 1200 B.C. was done on perishable materials. Other scholars have attempted to push back the introduction of the Phoenician alphabet by centuries in order to fill the gap. (See quite recently J. Naveh, "Some Semitic Epigraphical Considerations on the Antiquity of the Greek Alphabet," AJA 77 [19731: 1-8). These attempts rely on a very ancient date for certain Semitic inscriptions which do resemble the early Greek forms. As Velikovsky will show, the Semitic inscriptions derive their date from Egyptian chronology and need to be made later. Those wishing to push back the earliest Greek alphabet also must rely on the perishables theory to explain the lack of evidence for a pre-8th-century date. The perishables theory, relied upon by both the late Linear B and the early Phoenician proponents, is convincingly disputed by L. H. Jeffery in The Local Scripts of Archaic Greece (Oxford: 1961), p. 17. As long as the accepted chronology holds sway, this embarrassing gap will exist. A downward revision of Egypto-Mycenaean dates, of course, eliminates the gap, vindicates Wace, solves the problem of Cadmus (note 58 above), and shows why "early" Semitic inscriptions resemble so closely "much later" Greek ones. (62) A. J. B. Wace, "Preliminary Report,"p. 241. (63) Lord William Taylour, The Mycenaeans(London: 1964), p. 91. (64) W. B. Dinsmoor, The Architecture of Ancient Greece (New York: 19 50), p. 59. (65) Ibid., p. 62 for the date of the earliest known Proto-Ionic capital. The ivory carving, found in a Mycenaean chamber tomb in 1888, is depicted on plate 8,8 of the 1888 Ephemeris Archaiologike. The tomb and the contents are described in columns 145-47 of the same journal in "Anaskaphai Taphön en Mukenais" by C. Tsountas, the excavator. (66) Cp. G. E. Mylonas, Mycenae: A Guide to Its Ruins and Its Antiquities (Athens: 1972), p. 65 for a mid-13th-century date; and H. Wace, E. W. French and C. K. Williams II, Mycenae Guide, 6th ed. (Meriden, Connecticut: 1971), pp. 1, 7 for a 14th-century date. (67) The facade's decorative elements have been removed from the tomb and are now on display. The exact arrangement of the upper decoration is disputed. (68) D. S. Robertson, Greek and Roman Architecture, 2nd ed. (Cambridge: 1969), p. 64, n. 3. See also C. Schuchhardt, Schliemann's Excavations, pp. 144-45, and S. von Cles-Reden, The Buried People, trans. from German by C. M. Woodhouse (London: 1955), p. 35. (69) Robertson, Greek and Roman Architecture, p. 19. This belief has been long held by many people. See, for example, C. Tsountas and J. I. Manatt, The Mycenaean Age (New York: 1897), p. 232 and n. 3; C. Schuchhardt, Schliemann's Excavations, pp. 144-45; R. Higgins, Minoan and Mycenaean Art (London: 1967), p. 89. (70) R. M. Cook, "The Archetypal Doric Temple," ABSA 65 (1970): 17. (71) D. S. Robertson, Greek and Roman Architecture, p. 64. (73) Both G. Dennis (The Cities and Cemeteries of Etruria [London: 1883], vol. 1, pp. 265, n. 2, 386 and n. 6; vol. II, p. 154) and A. Mosso (The Dawn of Mediterranean Civilisation, trans. by M. C. Harrison [New York: 1910], pp. 392-93) saw the similarity of architectural type, and wanted to make the Italian tombs contemporary with the Mycenaean examples, but were puzzled by the fact that the contents of the Italian tombs were dated centuries later than those of Greece. (74) A. Neppi Modona, A Guide to Etruscan Antiquities, trans. by C. D. Tassinari (Florence: 1954), p. 92; S. von Cles-Reden, The Buried People, pp. 180-81; E. Langlotz, Ancient Greek Sculpture of South Italy and Sicily, trans. by A. Hicks (New York: 1965), p. 15; O. W. von Vacano, The Etruscans, pp. 81-82, 88-89, 119; L. Bernabò Brea, Sicily Before the Greeks, trans. by C. M. Preston and L. Guido, rev. ed (New York: 1966), p. 174; M. Guido, Sicily: An Archaeological Guide (London: 1967), pp. 102-1 3, 129-130; A. Boëthius and J. B. WardPerkins, Etruscan and Roman Architecture (Baltimore: 1970), p. 78. (75) J. M. Cook, "The Cult of Agamemnon at Mycenae" in Geras Antoniou Keramopoullou (Athens: 1953), pp. 114-15; A. M. Snodgrass, The Dark Age of Greece, p. 194. (76) A. M. Snodgrass, The Dark Age of Greece, pp. 192-94. (77) A. J. B. Wace, Chamber Tombs at Mycenae (Archaeologia, vol. 82, London: 1932), pp. 95, 127, 131. (78) I certainly would not advocate redating this tomb, thus all similar Mycenaean chamber tombs, and thus Mycenaean civilization as a whole on the basis of one sherd. If this were the sole reason for such a revision, the case would be not only weak but laughable. The fact is that this fits into a pattern not only for what we have seen at Mycenae but for other tombs as well. As merely one example I point to Tomb 6 at Asine. Here another chamber tomb which "had remained untouched" from LH III times until modern excavation of it, contained some Geometric sherds (9th or 8th century B.C.) "whose presence in the fill was clearly only adventitious" (O. Frödin and A. W. Persson, Asine: Results of the Swedish Excavations 1922-1930, ed. by A. Westholm (Stockholm: 1938], p. 181 and n. 1). Examples of whole pots in tombs 500 years too early or late will be treated elsewhere. How pots or even tiny sherds entered 500-year-older, sealed deposits is no problem if those intervening 500 years do not exist. (79) A. M. Snodgrass, The Dark Age of Greece, pp. 192, 397; and J. M. Cook, "The Cult of Agamemnon," pp. 112-18; and "The Agamemnoneion," ABSA 48 (1953): 30-68, especially p. 33. (80) See for example J. M. Cook's two articles cited in note 79. R. M. Cook ("The Dorian Invasion," Proceedings of the Cambridge Philological Society 188 (1962): 20 and n. 2) disagrees with his brother on this point. (81) A. M. Snodgrass, The Dark Age of Greece, pp. 5-7 and G. Raddatz, "Homeros" in Pauly-Wissowa's Real-Encyclopädie 16 (1913), 2206-13. In response to Snodgrass (p. 7), it is true that Thucydides (I. 3.3) says that Homer lived a long time after the Trojan War, but time is relative. In the same book (I. 12.2) Thucydides says that the Greeks fighting at Troy did not return to their homes for a long time. This second "long time" ranged from 10 years in Agamemnon's case to 20 years in the case of Odysseus. It is not necessarily true that Thucydides put Homer much later than that after Troy's fall. Herodotus does seem to separate Homer from the Trojan War. He is using two systems of reckoning, however. He calculated that Homer lived not more than 400 years before his own day (i.e., not earlier than the 9th century B.C.) (Book II. 53.2). He did not know when, or even if, the Trojan War really took place (II. 118.2). He got his information, including the date for the war, approximately 800 years before his time (II. 145.4), from Egyptian priests. He is quite explicit in dividing the two matters. Homer's date was his own calculation; Troy's fall was dated by the Egyptians (II. 99.1 makes the separation quite clear. See II. 113.1, 116.1, 118.2, 120.1, 145.3, 147.1, etc., where he specifies that his information on Troy and its fall came straight from the Egyptians). I need not remind the reader that Mycenaean chronology is based on Egyptian, and that Velikovsky shows that the latter is hundreds of years off. Even within Herodotus' account it is obvious that the Egyptians are lying to him. For example, they told this gullible passerby that the pyramids were constructed after the Trojan War. That lie alone accounts for over 100 of those 800 years (II. 124-135). Likewise the Egyptians dated the Ethiopian dynasty ca. 450 years too early (II. 140.2), while the Libyan dynasties were not mentioned at all. The whole account, then, is very suspect. With the major exceptions of Herodotus and Thucydides, most ancient sources explicitly made Homer a contemporary of, or slightly later than, Troy's fall. We've already disposed of the objection that Herodotus and Thucydides do not. (82) A list of objects discovered by 1930 is to be found in J. D. S. Pendlebury, Aegyptiaca (Cambridge: 1930), pp. 53-57. Still more items have been unearthed since then (e.g., another scarab of Queen Tiy from the Late Helladic shrine (Fig. 1,K)-see Taylour, . "Mycenae, 1968," p. 92). (83) See, for example, A. S. Murray, Excavations in Cyprus (London: 1900), pp. 21, 23, 24; and D. G. Hogarth, Excavations at Epliesus(London: 1908), p. 242. (86) Robertson, Greek and Roman Architecture, p. 30. (87) McDonald, Progress into the Past, p. 424. (88) M. L. Bowen, "Some Observations on the Origin of triglyphs," ABSA 45 (1950): 124. (89) R. M. Cook, "The Archetypal Doric Temple," p. 17. See also p. 19 and Cook's earlier article, "A Note on the Origin of the Triglyph," ABSA 56 (1951): 52. (90) M. L. Bowen, "Origin of Triglyphs," p.124. (92) The Roman author Vitruvius (De Architectura, Book IV. 2-3) postulated that the stone frieze represented original wooden members. D. S. Robertson, Greek and Roman Architecture, p. 32, also believed in an early constructional origin. Both Bowen, "Origin of' Triglyphs," pp. 113-14, and Cook, "Origin of Triglyphs," pp. 50-52, give good reasons for rejecting this notion. (93) M. L. Bowen, "Origin of Triglyphs," p. 113. (94) Robertson, Greek and Roman Architecture, p. 32. (95) Ibid. If the bench was used until the 8th century, both similarities to and differences with 7th-century friezes are easy to explain. (96) Bowen, "Origin of Triglyphs," pp. 121-22. (97) McDonald, Progress into the Past, pp. 423-24. See also Dinsmoor, The Architecture of Ancient Greece, p. 21; Bowen, "Origin of Triglyphs," p. 123; Tsountas and Manatt, The Mycenaean Age, p. 322; B. Schweitzer, Greek Geometric Art, trans. by P. and C. Usborne (New York: 1971, published posthumously), pp. 223-24. (98) A. M. Snodgrass, The Dark Age of Greece, p. 369. See also H. Drerup, Griechische Baukunst in geometrischer Zeit (Archaeologia Homerica II, 0, Göttingen: 1969), p. 77. (99) Drerup, Griechische Baukunst, p. 77. (100) Ibid., p. 82; A. M. Snodgrass, The Dark Age of Greece, p. 369; Dinsmoor, The Architecture of Ancient Greece, p. 58; D. M. Robinson, "Haus" in Pauly-Wissowa's Real-Encyclopddie, Supplement 7 (1940), 235. (S. Sinos, however, in Die vorklassischen Hausformen in der Agdis [Mainz: 1971], pp. 75-84, 87-90, 109-16, cites some examples of the co-existence of rectilinear, apsidal, and oval structures in the Middle, Late Bronze, and Dark Ages. He admits, p. 114, that there is no example of a megaron between Mycenaean times and the later temples.) A few apsidat houses do seem to have been built during the Late Helladic period but they were in vogue only during the Middle Helladic and "post-Mycenaean" times, were atypical in the Late Helladic period, and do not seem plentiful enough to span the time to connect the two peak periods. The most-often-cited example is that at Thermon where the date is in dispute. As is so often the case, about 500 years are at stake. Elsewhere I will treat this case, and intend to show that essential discontinuity, and an abrupt change with a 500-year throwback is not only true of "post-Mycenaean" architecture, but is also the case with the contemporary graves and the pottery. (101) Dinsmoor, The Architecture of Ancient Greece, p. 58; G. Rodenwaldt, "Zur Entstehung der Monumentaten Architektur in Griechenland," Ath. Mitt. 44 (1919): 179-180; G. Rodenwaldt, "Mykenische Studien I," Jahrbuch (of the German Archaeological Institute) 34 (1919):95 and n. 2. (102) Robertson, Greek and Roman Architecture, p. 36; Schweitzer, Greek Geometric Art, p. 224; G. Rodenwaldt, "Mykenische Studien I," p. 9 5, n. 2. (103) H. Drerup, "Griechische Architektur zur Zeit Homers," Archdologischer Anzeiger (1964): 180: "Mykenische Denkmäler werden also im Gegensatz zur Homerinterpretation keine Rolle spielen." (104) H. L. Lorimer, Homer and the Monuments (London: 1950), pp. 407-10; see also Tsountas and Manatt, The Mycenaean Age, pp. 62-66; See also T. B. L. Webster, From Mycenae to Homer (New York: 1964), pp. 11 2-113. (105) H. L. Lorimer, ibid., p. 407. (107) For a brief list of finds see G. Karo, Führer durch Tiryns, 2nd ed. (Athens: 1934), pp. 47-49. (108) A. Frickenhaus, "Die Hera von Tiryns," Tiryns I (Athens: 1912), pp. 35f. (109) C. Blegen, "The So-called Temple of Hera at Tiryns," an appendix to Korakou (New York: 1921), p. 132. (110) Ibid., 132-33; G. Mylonas, Mycenae and the Mycenaean Age, p. 49. (111) Bowen, "Origin of Triglyphs," pp. 122-23. He incorrectly dates the Korakou example to Middle Helladic times (see Blegen, Korakou, pp. 80-83, 133). The only other Bronze Age examples he gives are a house from the VIth level at Troy, the archaeology of which we will soon examine, and the structure at Tiryns. (To this one should add an LH III example from Attica. See G. Mylonas, Aghios Kosmas [Princeton: 1959], "House T," p. 55 and fig. 15.) Bowen rightly suspects the 9th-century date assigned to the Artemis Orthia temple at Sparta (see Snodgrass, The Dark Age of Greece, p. 277); more recently see H. Drerup, Griechische Baukunst, p. 89. (112) Snodgrass, The Dark Age of Greece, p. 398. (113) Since Velikovsky has released his chapter on Tiryns (Pensée [Winter, 1973-74] pp. 45-46), I have left out much detail in order not to repeat his points. In addition to Velikovsky's article, the reader is referred to H. Drerup, Griechische Baukunst, pp. 17-18, 89 for a succinct statement of the case and the opposing views. Drerup himself pointedly abstained from giving his own opinion. His bibliography is quite extensive, but by no means exhaustive. A similar situation exists with two Mycenaean edifices on the island of Delos. The excavator claims that both of these—one, a sanctuary—stood until ca. 700 B.C., and that the sanctuary was then converted into a Greek temple. Snodgrass (The Dark Age of Greece, pp. 395-96) and others (ibid., p. 439, n. 36) reject this 400-year-long continuity. (114) R. V. Nicholls, "Greek Votive Statuettes," p. 17. (115) Ibid., p. 21. Nicholls seeks perishable (i.e., wooden) models to fill the gap here, as did Bowen for similarities of Doric triglyphs to Mycenaean friezes, as did some for connecting Linear B and the Phoenician alphabet. Likewise it had been proposed, and rightly rejected, that the connection between Mycenaean palatial architecture and 8th-century temples was to be found in monumental megaron-shaped wooden temples (G. Rodenwaldt, "Zur Entstehung," p. 179 f.). Why the Greeks should have used perishables exclusively during the Dark Age to connect similar nonperishable items separated by 500 years, when we know that they still fired clay, made metal objects, and used stone during that period is not adequately explained. Since they continued to make pottery on the wheel, they could quite easily fashion figurines in that way, rather than carving them from wood. The lack of wheel-made terra cotta votives to span those 500 years requires another explanation. (117) The number of ships is commonly (but incorrectly) said to be 1,000. Thucydides(I.10.4) speaks of 1200, while the sum preserved in the Iliad (II. 494-7 50) is 1186. (118) J. Forsdyke, Greece Before Homer (London: 1956), p. 68. (119) A. R. Burn, Persia and the Greeks (London: 1962), p. 11; see pp. 11-13. (120) I. Velikovsky, "Astronomy and Chronology," Pensée (Spring-Summer, 1973): 38-49. Other ancients also dated the war early. We have already seen that the most ancient source, Herodotus, also got his date from the Egyptians, who were obviously lying to him (see n. 81 above). Other estimates ranged from the 14th-12th centuries B.C. (see Forsdyke, Greece Before Homer, p. 62 and G. Mylonas, "Priam's Troy and the Date of its Fall," Hesperia 33 [1964): p. 353, n. 3). These dates are challenged as too early even by adherents to the accepted chronology. I hope to treat this topic in detail at a later date. (121) C. W. Blegen, the latest excavator of the site, pushed the date progressively back (see "New Evidence for Dating the Settlements at Troy," ABSA 37 [1936-1937): 12 for 1200 B.C. ; Troy IV.1 [Princeton: 19581, p. 9 for pre-1230 B.C. ; "Troy," Cambridge Ancient History [henceforth CAH], fascicle 1 , p. 14 for 1250 B.C. ; Troy and the Trojans [London: 1964], p. 174 for 1260 B.C.). Other archaeologists lean more toward Blegen's original assessment of ca. 1200 B.C. (see Blegen, CAH fascicle, p. 14, n. 1; C. Nylander, "The Fall of Troy," Antiquity 37 (1963): 7, 10, 11; G. Mylonas, "Priam's Troy," pp. 362-66). The problems are complex: how much earlier than the destruction of Pylos the destruction of Troy should be; whether certain potsherds from Troy VIIA are very late LH IIIB or very early LH IIIC; the time of the transition from LH IIIB to LH IIIC. These need not detain us here. For our purposes, the archaeological date falls sometime within the 13th century B.C. (122) Blegen, Troy and the Trojans (henceforth T & T) pp. 159-61, 174. (123) K. Friis Johansen (The Iliad in Early Greek Art [Copenhagen: 1967], p. 36) sets the influence of the Iliad on art at ca. 700. J. N. Coldstream (Greek Geometric Pottery [London: 1968], p. 351) has one scene appear early in the 8th century, but Johansen, pp. 23-25, does not think that the Iliad itself is responsible for that scene. The subject, Siamese twins, need not be connected with Nestor's account in Book XI of the Iliad, or even be connected with Nestor. In any case, no example exists before the 8th century. Of course, the lack of figural representation during the Dark Age could account for this, and this is not prima facie evidence that the war was fought this late. (124) See note 81 above. (126) Isaacson, "Carbon 14 Dates." p. 28.see n. 33, p. 32 for references. (127) See n. 111 above. (128) D. Page, "The Historical Sack of Troy,"Antiquity 33 (1959): 31. (129) Since most of the material from Troy VIII was found on the lower slopes of the mound, one would expect the erosion of the upper mound to deposit a layer of the dissolved remains of the mud brick houses, etc., from higher up the slope. Such a layer should be found above the last deposits of Troy VII and below the first of Troy VIII. For just such an instance from another mound and a good explanation of the process see K. M. Kenyon, Digging up Jericho (London: 1957), pp. 44-45, 171, 259-60, 261; and M. Wheeler, Walls of Jericho (London: 19 58), pp. 43, 55, 124. (130) Those authors (Lykurgus, In Leocrantem, 62; and Strabo, XIII.I.41-42) make it quite clear that the abandonment lasted at least till the Roman period. Strabo considered Hisarlik not to be the Troy of Homer (XIII. 1. 25, 35, 37, 38). For these and other literary, archaeological, stratigraphical, geographical, and topographical reasons, this writer is unconvinced that Hisarlik is the site of the Homeric Troy. He is further unconvinced that the burning of layer VIIa was the work of the Greeks, or, in fact, of invaders. J. L. Caskey, a participant in the Cincinnati expedition, who does believe that Hisarlik is the site of Troy, states some of this writer's reservations very well ("Archaeology and the Trojan War," Journal of Hellenic Studies 84 : 9). Since it is generally accepted that the Trojan War was fought at Hisarlik, its archaeology is important. (132) Blegen (T & T, p. 172) suggests this, but see below. (133) C. W. Blegen, et al., Troy IV.1 (Princeton: 1958), p. 147. (135) W. Dörpfeld, Troia 1893, Beticht fiber die im Jahre 1893 in Troia veranstalten Ausgrabungen (Leipzig: 1894), p. 64. (136) W. Dörpfeld, Troia und Ilion (Athens: 1902), pp. 31, 201. (137) H. Schmidt, "Die Keramik der verschiedenen Schichten" in Dörpfeld, Troia und Ilion, pp.296-98. (138) Blegen, Troy IV.1 p. 4. (139) Blegen, "New Evidence," p. 12. Although he set the division at 900, rather than Dörpfeld's 700 B.C., he still had one layer follow immediately after the other. The journal for 1936-1937 was not released until 1940, two years after excavations at Troy had ceased. From the article (p. 10) it is clear that Blegen wrote after the end of his last season, and, whenever the article was submitted between 1938 and 1940, there is no evidence that he changed his mind before publication of the volume (there is no postscript, or corrigendum attached). (140) A. Furumark's monumental work of dating Mycenaean pottery by Egyptian associations came out shortly after the Troy excavations had ended. (141) Blegen, et al., Troy I.1 (Princeton: 1950), p. 23; Blegen, Troy IV.1, p. 250. (142) Blegen, Troy IV.1, p. 251. Also see pp. 147,252-53, 257. (143) W. Lamb, "Grey Wares from Lesbos," Journal of Hellenic Studies 52 (1932): 1-2. See Blegen, Troy IV.1, p. 253. (144) Blegen, Troy IV.1, p. 250, 291-93. (145) Ibid., pp. 253, 265. (146) Blegen, Troy I.1, pp. 20-21. (147) Blegen, Troy IV.1, pp. 158, 181. (149) Ibid., p. 158. Blegen, as we saw in my previous article (Pensée [Spring-Summer, 1973], p. 27) was faced with the same problem of 7th-century sherds in bona fide Mycenaean strata at Pylos and was again at pains to account for this state of affairs. (151) Ibid. Blegen compares it to V. R. Desborough's low-footed skyphoi with pendent semicircles. See Desborough (Protogeometric Pottery [henceforth PGPI [Oxford: 19521, p. 192). (152) For scholarly opinions on the Euboean and/or Cycladic manufacture and the range of dates for this type of cup, see Desborough, PGP, pp. 192-94; Desborough, "A Group of Vases from Amathus," Journal of Hellenic Studies 77 (1957): 218; Desborough, "The Low-Footed Skyphoi with Pendent Semi-circles," Archäologischer Anzeiger (1963), cols. 204-205; Desborough, The Greek Dark Ages (London: 1972), pp. 186, 197 and see 199; O. T. P. K. Dickinson in Popham and Sackett's Excavations at Lefkandi, etc., p. 28; J. N. Coldstream, Greek Geometric Pottery, p. 330; A. M. Snodgrass, The Dark Age of Greece, pp. 71, 98 n. 4, 335 and index p. 448; H. W. Catling, "A Pendent Semicircle Skyphos from Cyprus and a Cypriote Imitation," Reports of the Department of Antiquities of Cyprus, 1973 (Nicosia: 1973): 184-85. Most exports of this ware to the East Mediterranean (presumably including the example from Troy) are thought to belong to the early 8th century (Desborough, PGP, pp. 192-94; Snodgrass, The Dark Age of Greece, p. 335) but possibly continued into the 7th century (Snodgrass, The Dark Age of Greece, p. 98 n. 4). To my knowledge, no one has treated the example from Troy to determine its date within the 9th-7th-century range, but wherever it falls, its find spot still poses a serious stratigraphical problem for the standard chronology. (153) Blegen, Troy IV.1, p. 231. If Troy VIIb2 really ended ca. 1100 B.C., this sherd of the 9th, 8th, or 7th century ought to lie above this layer. Instead, it was found stratified ca. 21/2 m. below, and two buildings were constructed over the spot where the sherd was found. Since no contamination was detected, these buildings assigned to the 12th century B.C. should postdate this 9th, 8th, or 7th-century sherd, and the "12th-century" Mycenaean pottery they contained ought to postdate the sherd as well. See Fig. 359 of Troy IV.2. (154) See notes 133, 139, 141 above. (155) Blegen. CAH fascicle, p. 15; T & T, p. 172. (157) I. Velikovsky, Ages in Chaos, pp.179-222. (158) Stiebing, p. 11. Actually, Velikovsky only refers to one of the destructions at Ugarit, that which fell during Akhnaton's reign. He assigns this to the mid-9th century B.C. The final destruction of the city occurred some time after that, in the 8th-7th, or perhaps even early 6th century B.C. (159) A. Westholm, "Built Tombs in Cyprus," Opuscula Archaeologica II (1941): 30. (162) Ibid., pp. 52-53. See also A. Westholm, "Amathus," in E. Gjerstad, et al., The Swedish Cyprus Expedition (henceforth SCE) II (Stockholm: 1935), p. 140, and E. Sjöqvist, "Enkomi," SCE I (Stockholm: 1934), pp. 570-73. (163) E. Gjerstad, SCE IV.2 (Stockholm: 1948), p. 239; V. Karageorghis, Excavations in the Necropolis of Salamis I (Salamis, vol. 3) [Nicosia: 1967], p. 123. (164) D. Ussishkin, "The Necropolis from the Time of the Kingdom of Judah at Silwan, Jerusalem," The Biblical Archaeologist 33 (1970): 45-46. (165) The foundation date was disputed in antiquity. Most ancient estimates fell within the range of 846-751 B.C. Of particular interest for our purposes is the fact that a number of ancient authors stated that Carthage was founded before the Trojan War. (166) G. C. and C. Picard, The Life and Death of Carthage, trans. from the French by D. Collon (London: 1968), p. 47. (167) Ibid., p. 52, and see C. Picard, "Installations Cultuelles Retrouvèes au Tophet de Salammbo," Rivista degii Studi Orientali 42 (1967): 189-99. (168) Picard, "Installations," sees close relations between the Ras Shamra and Carthage tombs but recognizes the chronological difficulty. His suggestion, pp. 197-98, that this tomb type came from Cyprus does not help matters. The Carthaginian settlers were primarily Syro-Phoenicians, not Cypriots. Besides, he seems not to realize that the type did not survive in Cyprus from Bronze Age times (contra. p. 197). Like the Carthaginian example, it "came back" after a mysterious chronological gap. Even if we make the Carthage example depend on Cyprus, not Syria, we are still left with the puzzle of how and why the Cypriots copied, yet did not copy, the 600-year extinct tombs of Ras Shamra or Enkomi. (169) C. F. A. Schaeffer, Ugaritica II (Paris: 1949), pp. 5, 47. See H. Frankfort, The Art and Architecture of the Ancient Orient (Baltimore: 1963), p. 150 for their assignment to the Mitannian period, p. 140 for his dates for that period; D. E. Strong, Greek and Roman Gold and Silver Plate (Glasgow: 1966), p. 53. (170) Frankfort, Art and Architecture, p. 150. (171) P. Dikaios, "Fifteen Iron Age Vases," Report of the Department of Antiquities of Cypris, 1937-1939 (Nicosia: 1951): 137. (172) Schaeffer, Ugaritica II, p. 47. (173) M. Vieyra, Hittite Art, pp. 45-46. (174) Schaeffer, Ugaritica II, pp. 22-23: "Une influence de ce cotè est chronologiquement impossible, tous les monuments assyriens actuellement connus où figurent des chevaux au galop étant-postérieurs de pros d'un demimillénaire & notre patère." (175) Frankfort, Art and Architecture, p. 150. (176) Strong, Gold and Silver Plate, p. 53. (177) L. Woolley, Alalakh (Oxford: 1955), p.384-99. (178) H. Frankfort, Art and Architecture. On p. 166 he speaks of the Dark Age. He saw similarities between Alalakh and Zincirli in constructional technique employed by the architect but invisible to onlookers (p. 145), and in ground plan (p. 167). He was, in fact, so struck by these similarities that he disbelieved a break in architectural continuity during the Dark Age (p. 163). Yet he himself has shown that, by the accepted scheme, the palace at Alalakh and other contemporary buildings were all destroyed long before Zincirli's palace was built, and he fails to cite any intermediary structures to fill the gap between 1200 and 850 B.C. (pp. 163-66). (179) W. F. Albright's attempt ("Northeast Mediterranean Dark Ages and the Early Iron Age Art of Syria" in The Aegean and the Near East, ed. S. Weinberg [Locust Valley, New York: 1956], pp. 144-65) to bridge the chronological gap fails. While many of his remarks are quite cogent, he disregards much evidence for dating some finds, and, as was his custom, chose dates to suit his own scheme. (180) Frankfort (Art and Architecture, p. 162) believed that the building called a temple by Woolley may have been a palace. (181) L. Woolley, A Forgotten Kingdom (London: 1959), pp. 132-33. (182) Woolley (ibid., p. 132) pushes the lions back to the 10th century, but Frankfort (Art and Architecture, p. 166) shows that they only go back to the 9th century. (183) Woolley, A Forgotten Kingdom, p. 133. (184) Seton Lloyd, The Art of the Ancient Near East (New York: 1961), p. 274. Lloyd is actually speaking of stone sphinxes from the Hittite capital of Boghaz Köy foreshadowing Assyrian bulls and lions, but the quotation fits the Alalakh lions as well. (185) Woolley, A Forgotten Kingdom, p. 152. (186) W. S. Smith, Interconnections in the Ancient Near East (London: 1965), p. 109. Smith actually refers to Hittite art, but the situation is the same for the Alalakh lions. See also Lloyd, Art of the Ancient Near East, pp. 193-94, and Woolley, A Forgotten Kingdom, p. 133. Smith, Lloyd, and Woolley all wanted to connect the "early" lions with the "late" ones, but they could not bridge the Dark Age pointed out by Frankfort (Art and Architecture, pp. 164-66), which should separate the two groups. It is true that the Alalakh lions are less sophisticated than other lions from this region, but that need not be a sign of a very early date. Frankfort (Art and Architecture, p. 254, n. 7) speaks of various degrees of success, or lack of it, in local carvings of the 9th century, citing the Alalakh sculptures as an earlier precedent. (187) As merely one case of consistency, let us reconsider the "12th-century" LH IIIC period. At Pylos (Isaacson, "Carbon 14 Dates") we found 7th-century pottery mixed with the 12th. In this paper we have seen that stylistically LH IIIC figural pottery most resembles 7th-century ware. Stratigraphically 7th-century sherds were mixed with LH IIIC inside the Lion Gate of Mycenae. At Troy two LH IIIC structures were built over a 9th or 8th-century sherd, while 7th-century pottery was found stratified directly above, mixed with, and under LH IIIC. Many more cases exist (e.g., the perplexing mixture of LH IIIC with early 7th-century pottery in a stratum of Scoglio del Tonno near Taranto in South Italy). Why don't stylistic and stratigraphical considerations cause the redating of this period? As was pointed out earlier (Isaacson, "Carbon 14 Dates," p. 27, and notes 12, 13, and 20) this period is connected with Pharaoh Ramses II. Utilizing other evidence, Velikovsky has redated this king from the 13th to the late 7th century B.C.